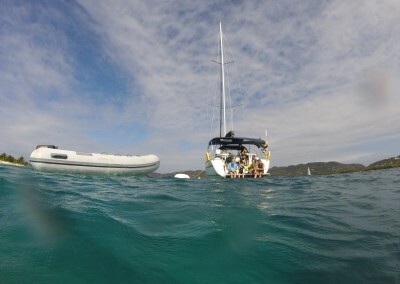 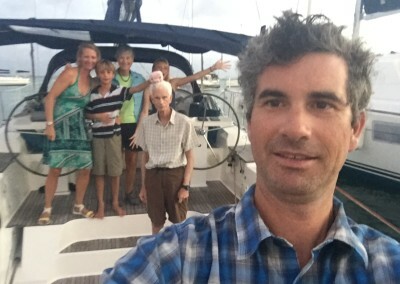 We have not seen our families since November when we said good bye to Peter (PaPete) and Sally (Baba) back on St John. 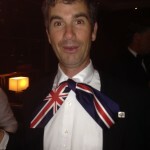 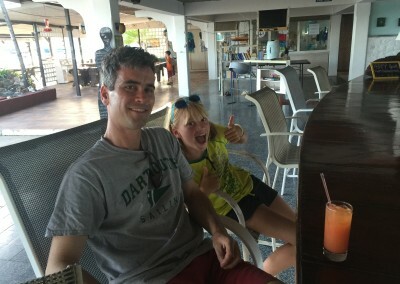 That is until February 24th when we had an excellent visit from Rob Bent (Uncle Rob!) 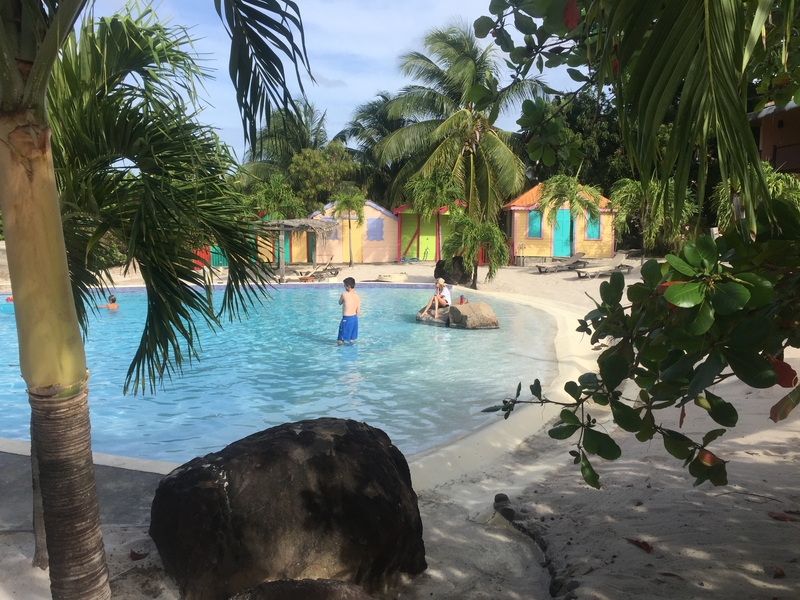 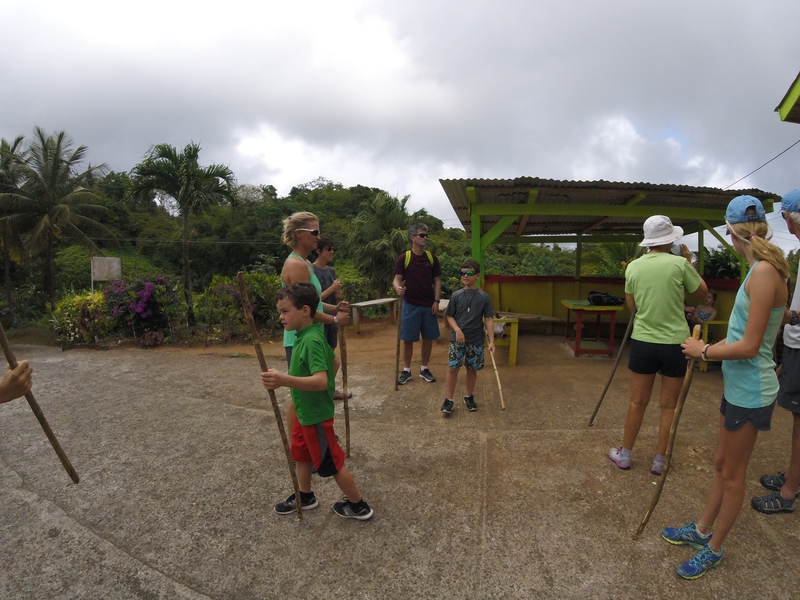 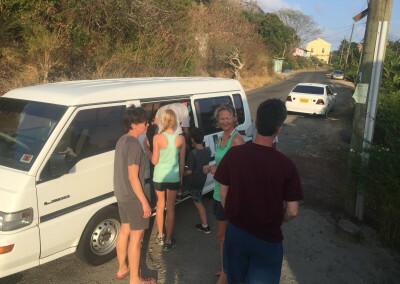 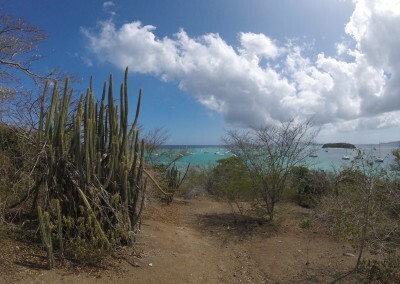 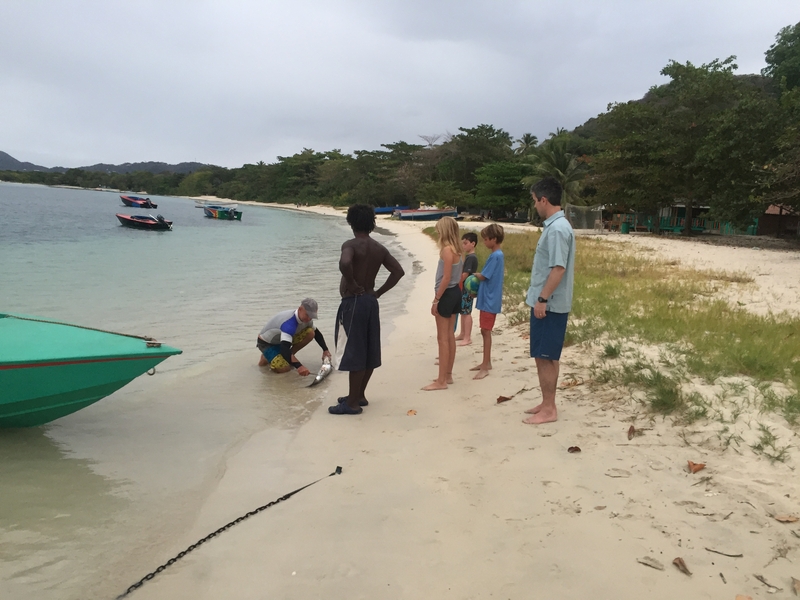 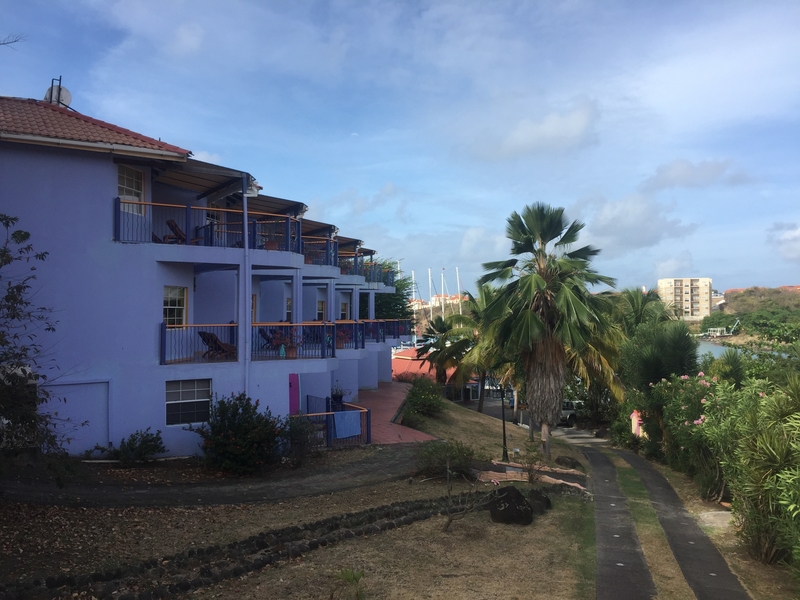 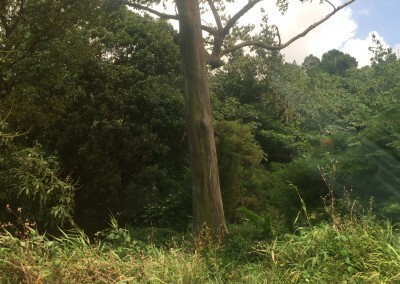 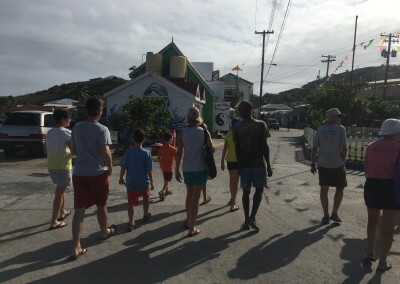 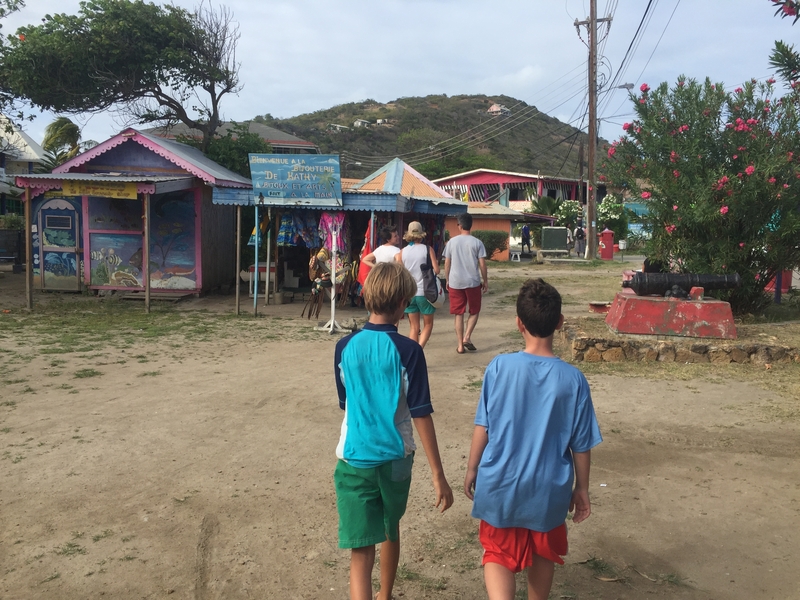 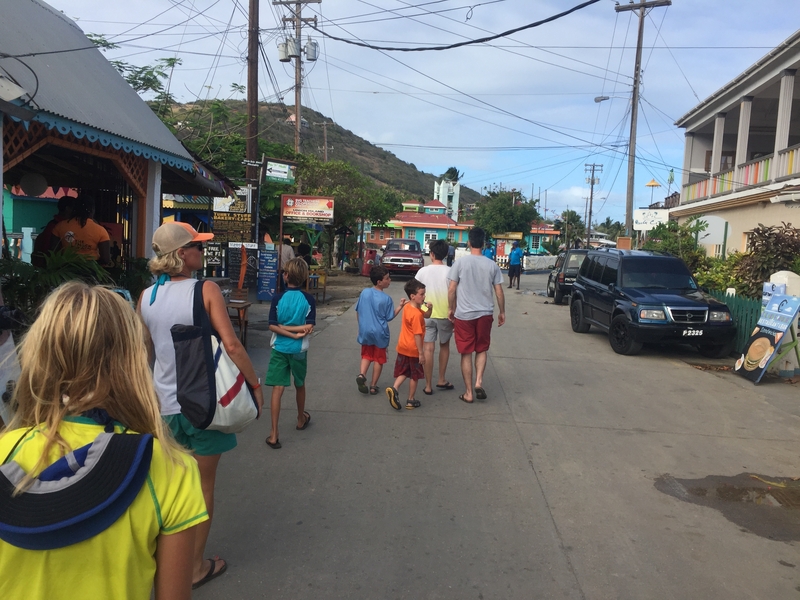 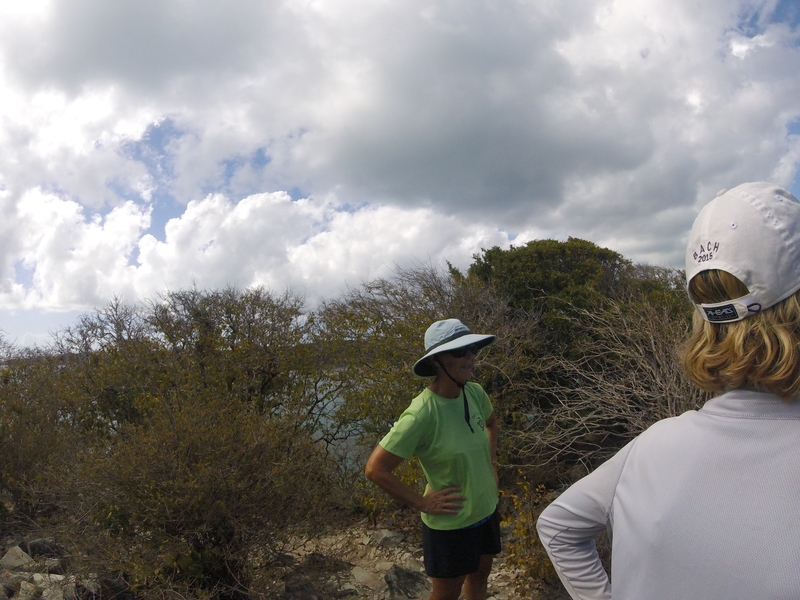 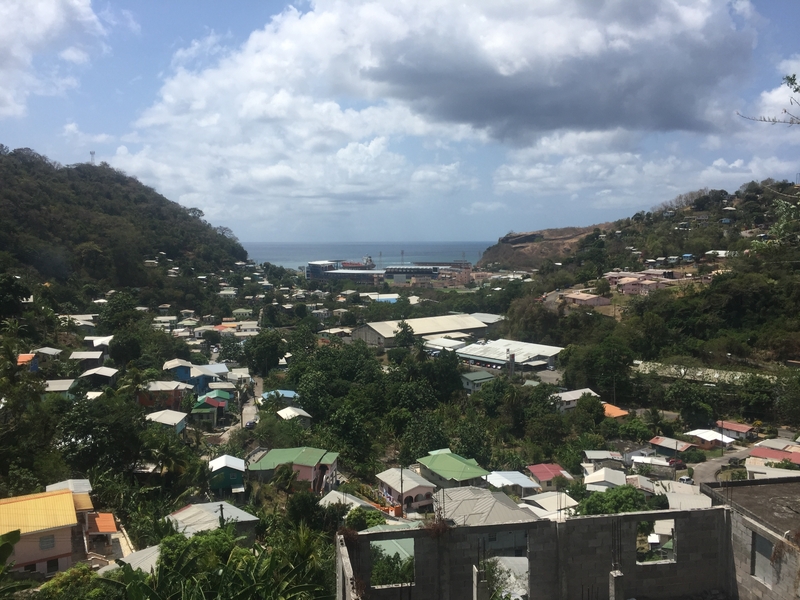 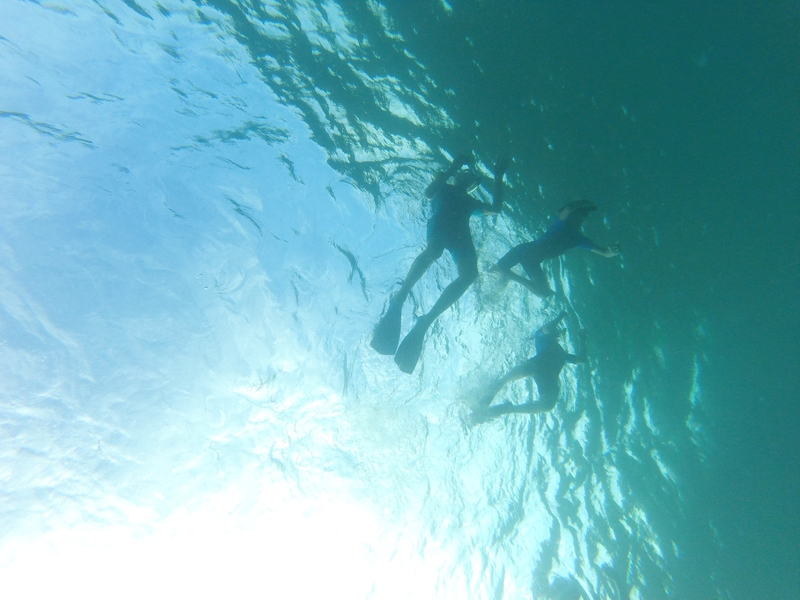 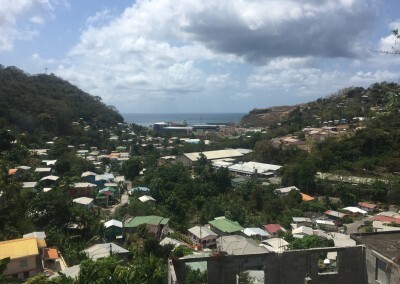 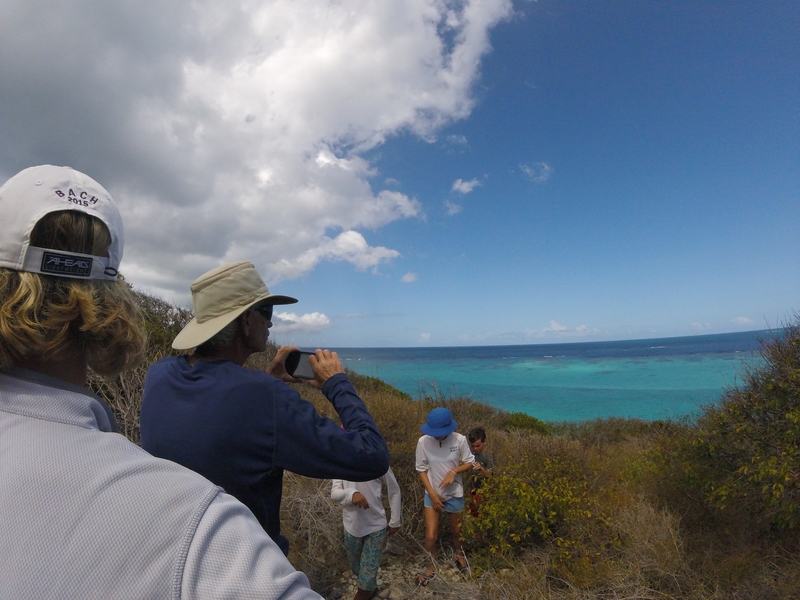 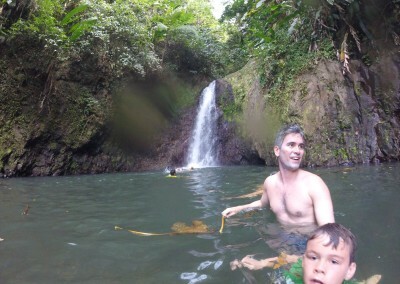 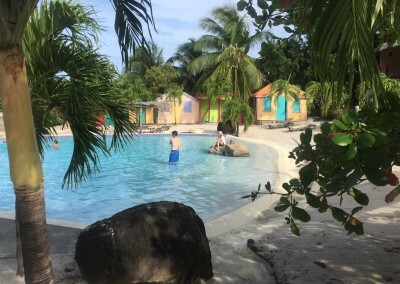 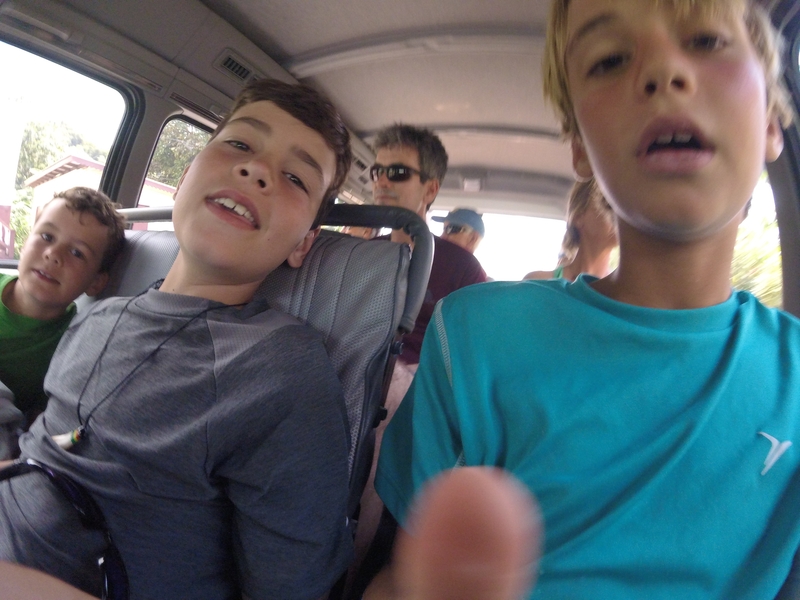 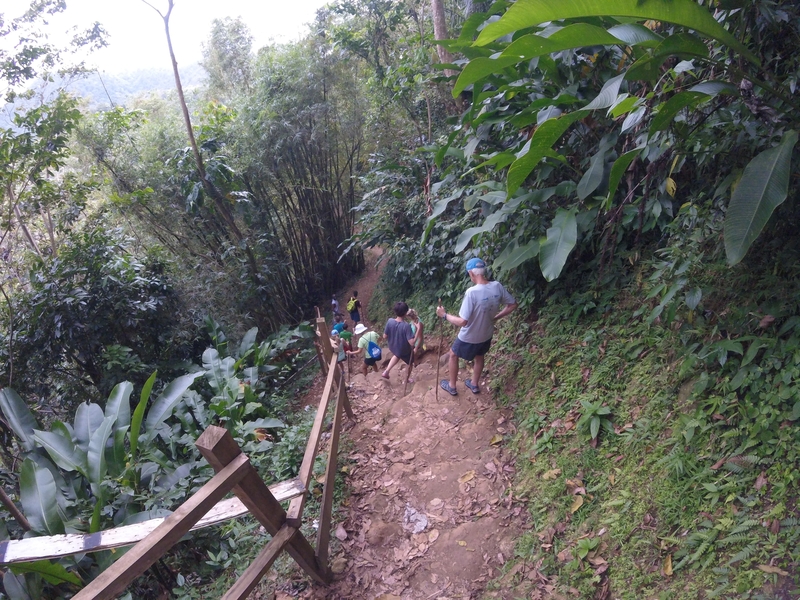 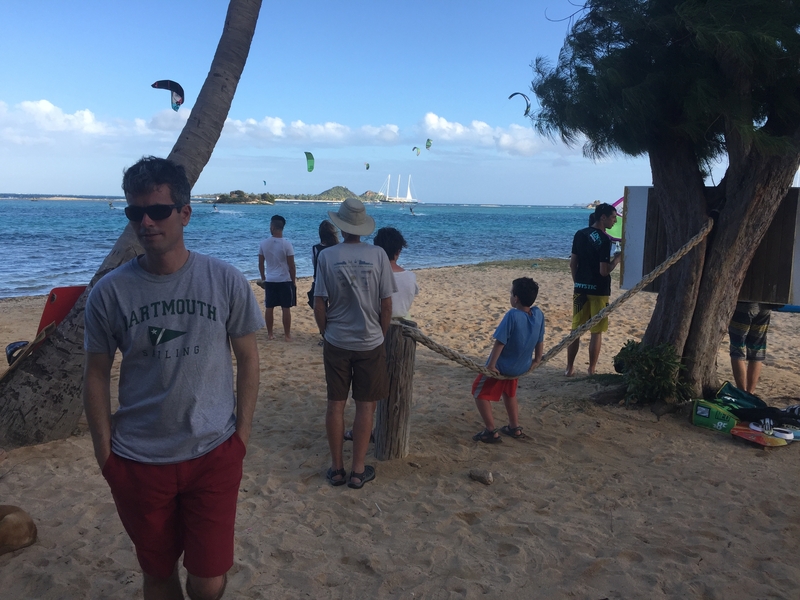 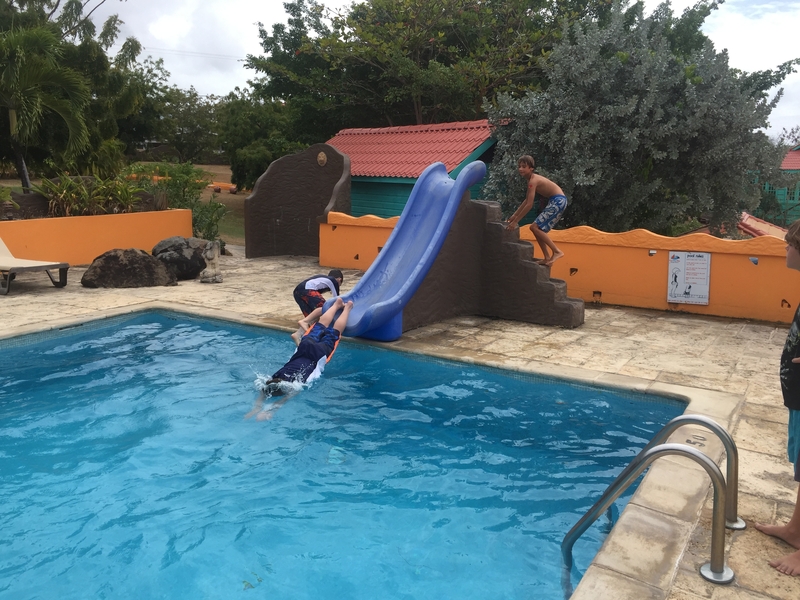 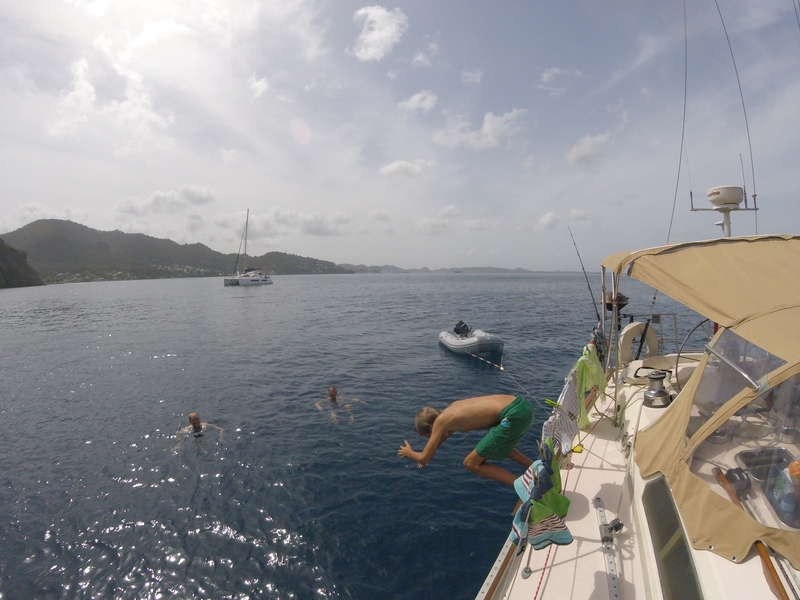 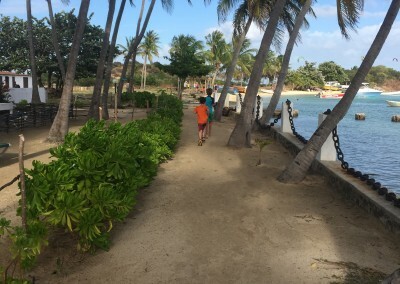 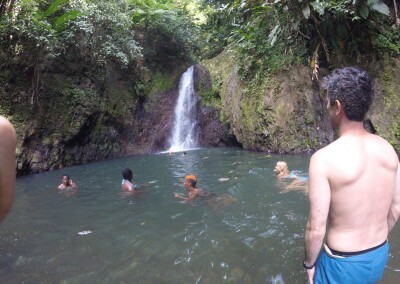 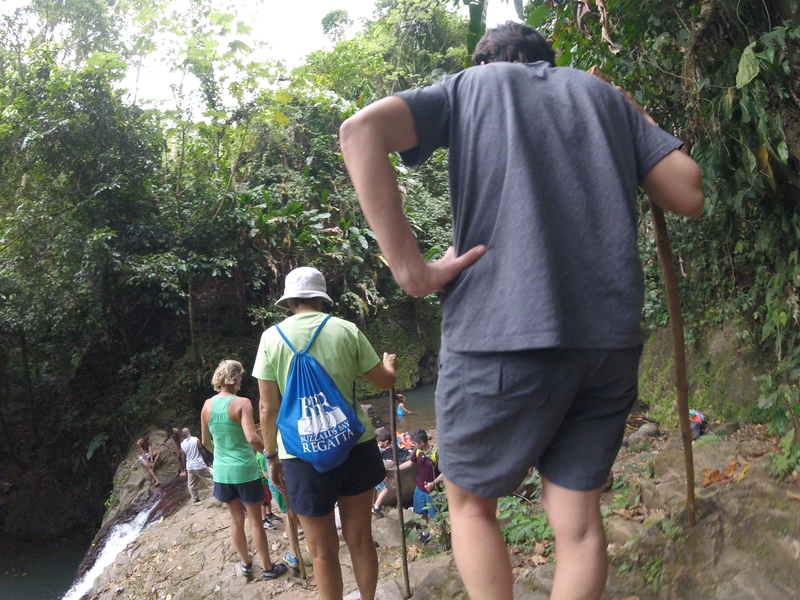 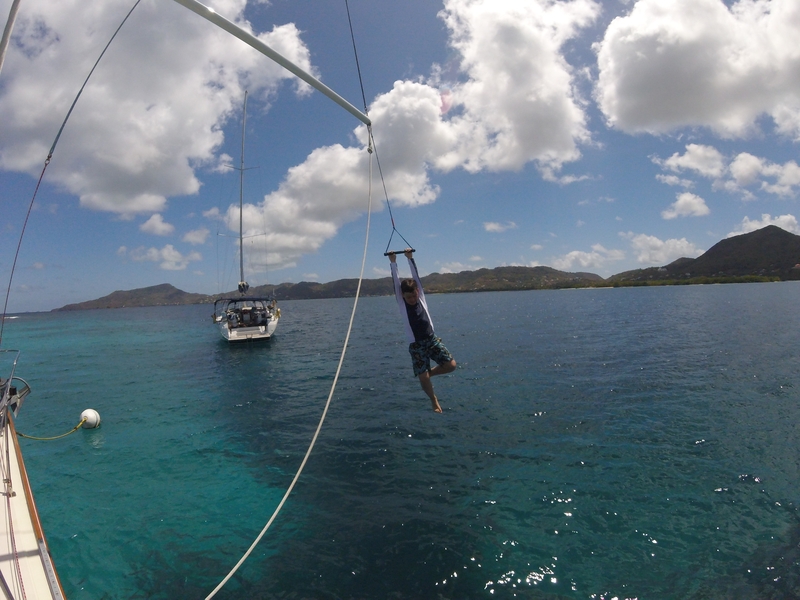 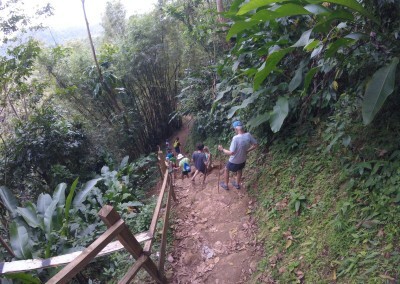 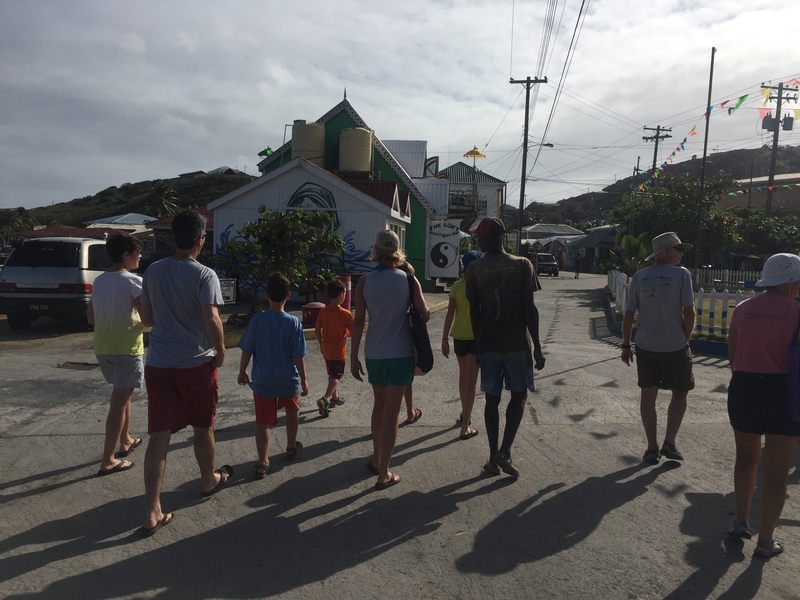 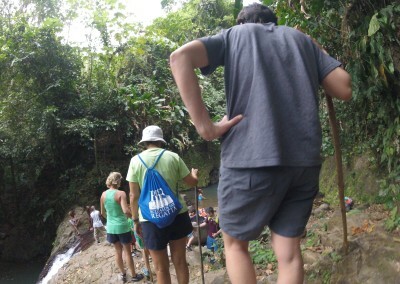 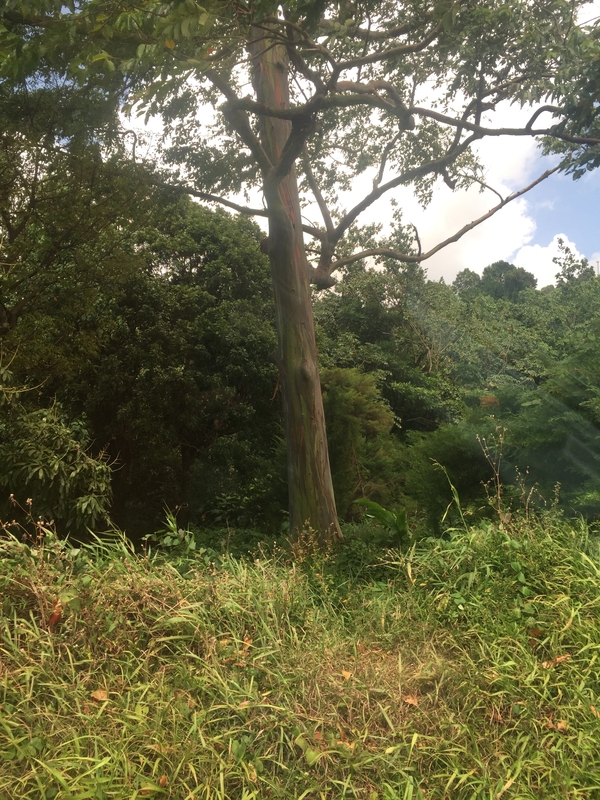 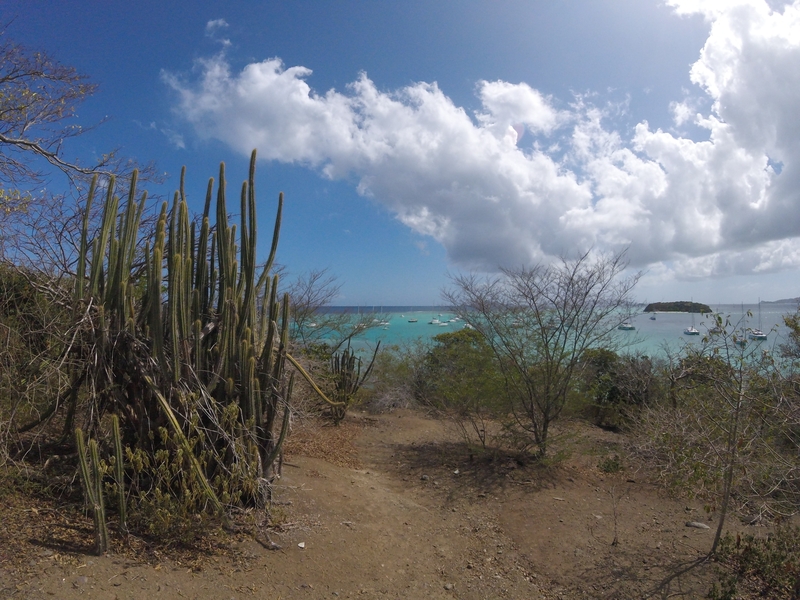 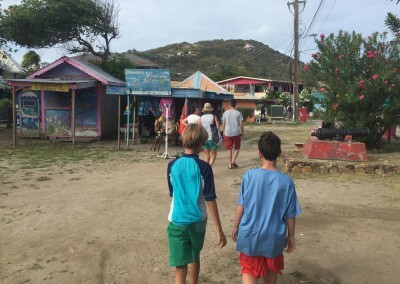 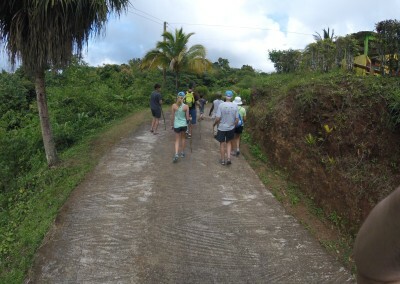 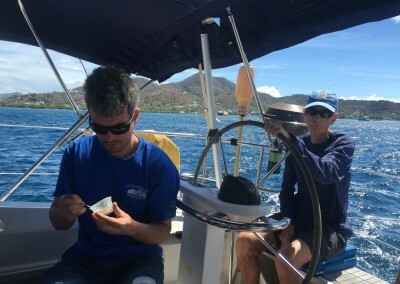 With Rob we toured the area from southern Grenada up to the Tobago Cays, and we had a bit of a sleep over with a bunch of bats along the way – read about our adventures with Rob here: A new chapter begins! 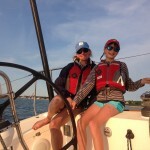 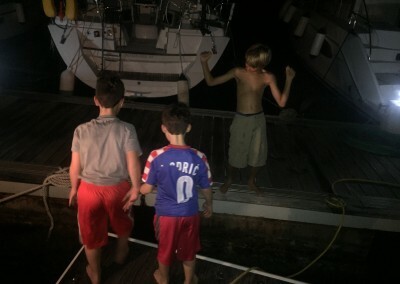 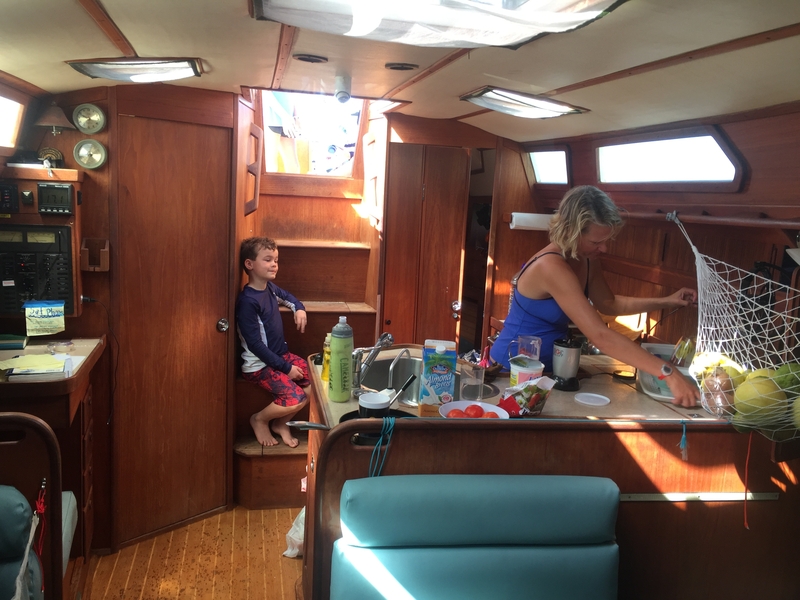 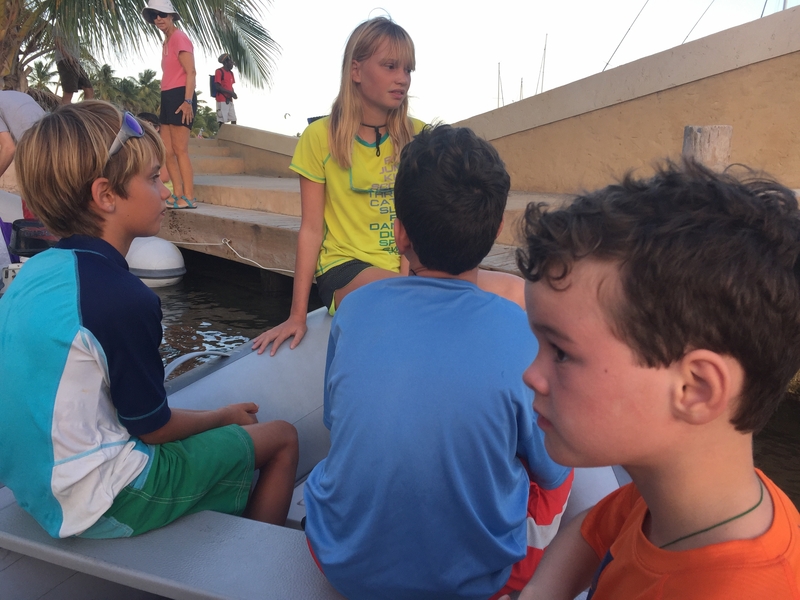 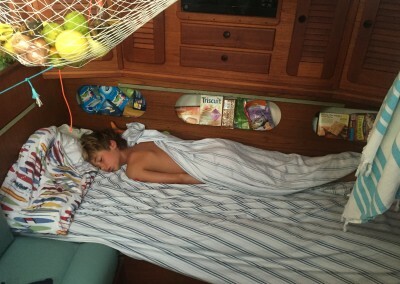 After Rob left, we had two days to buckle down and get some school and boatwork done before the arrival of Hurricane Herlihy. 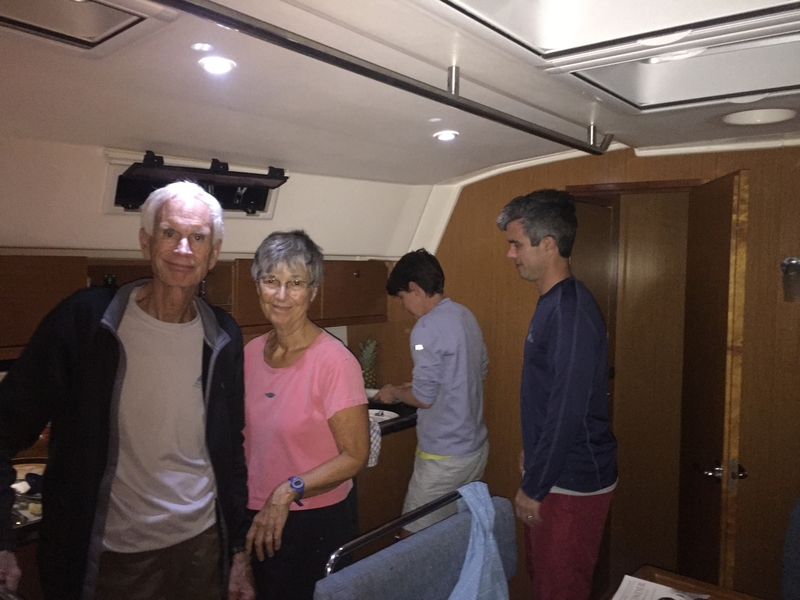 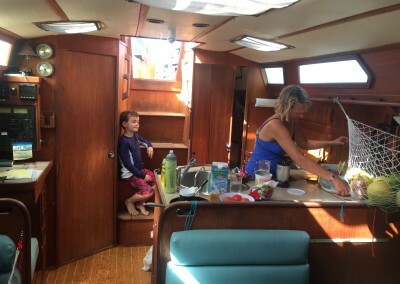 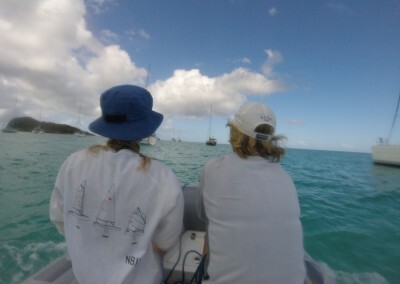 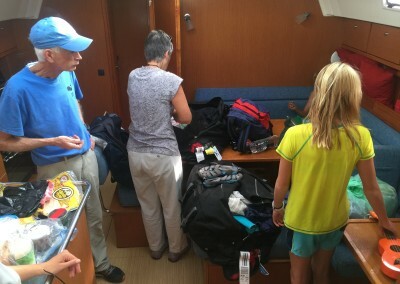 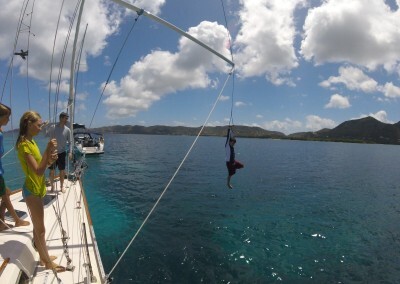 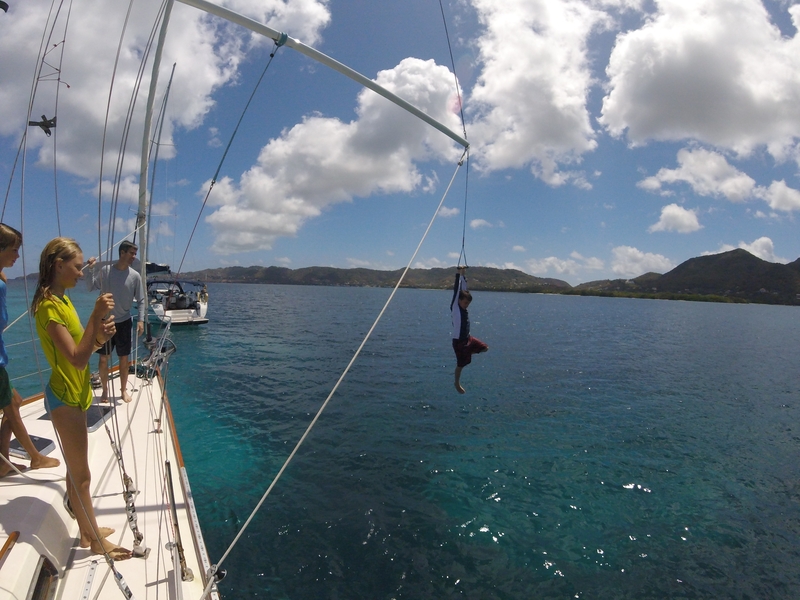 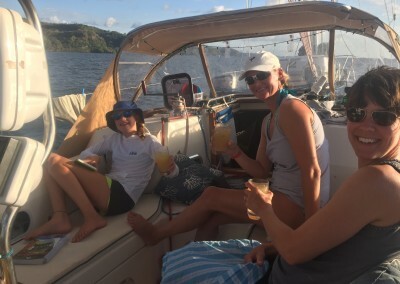 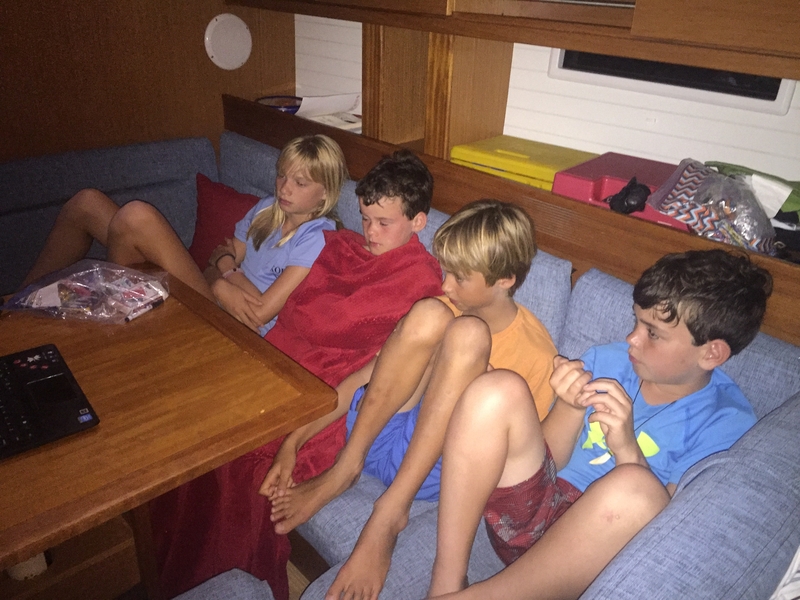 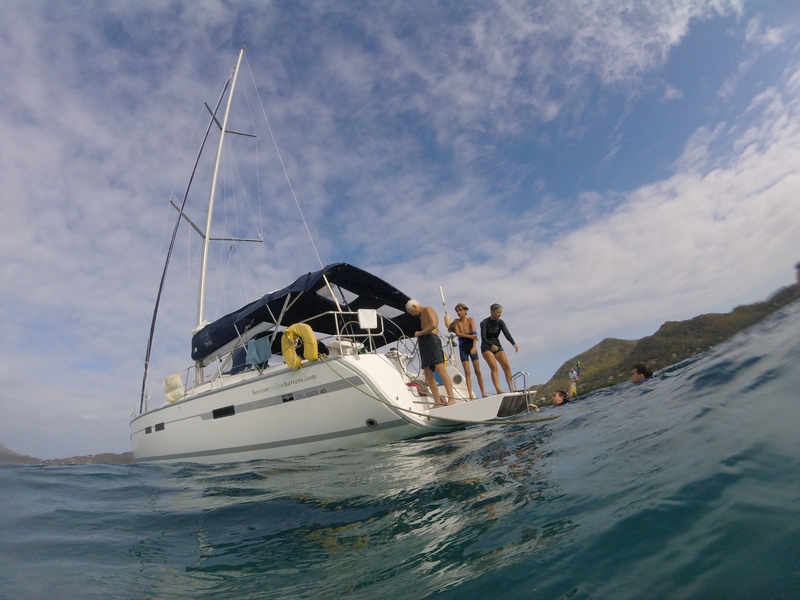 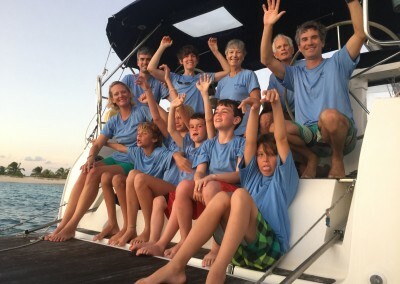 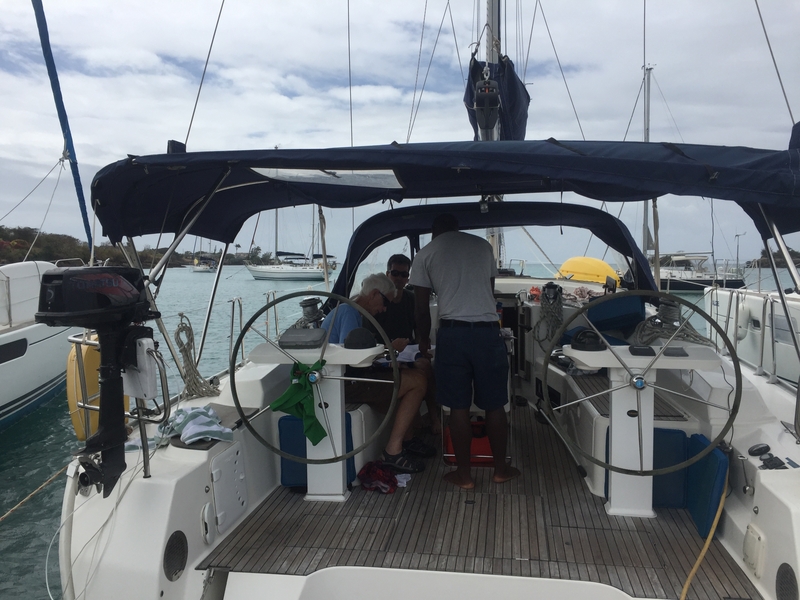 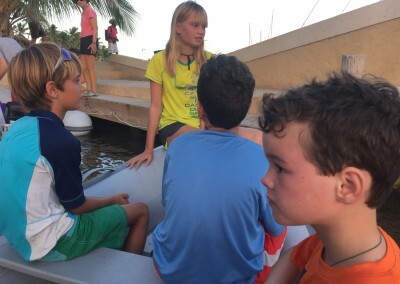 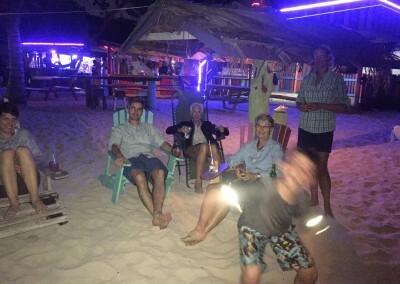 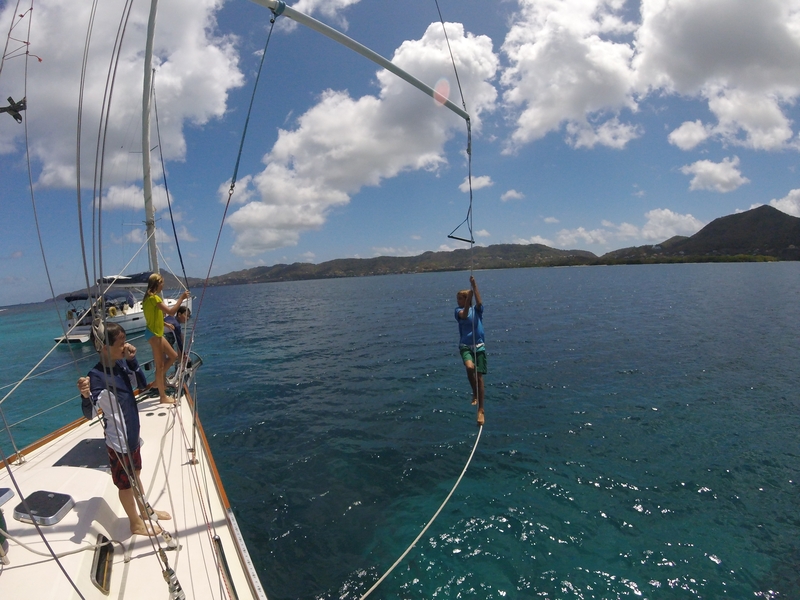 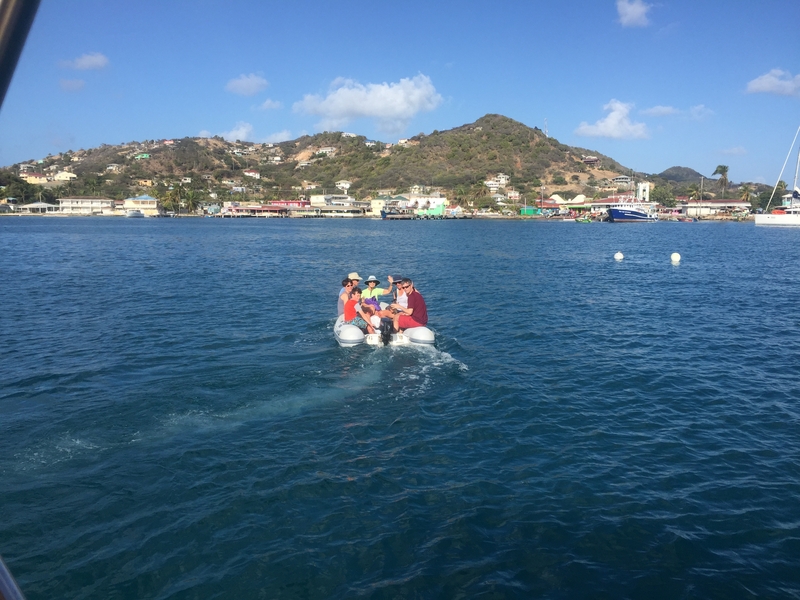 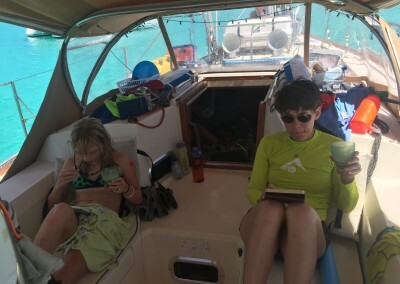 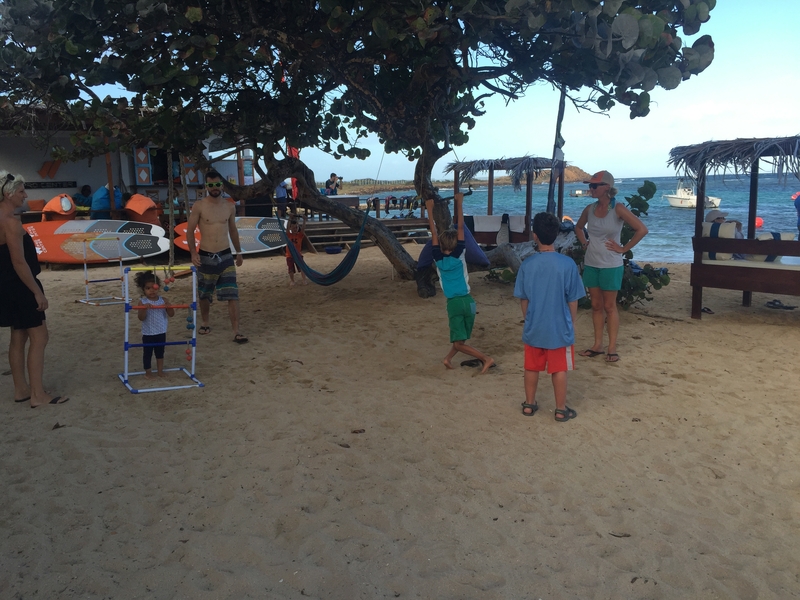 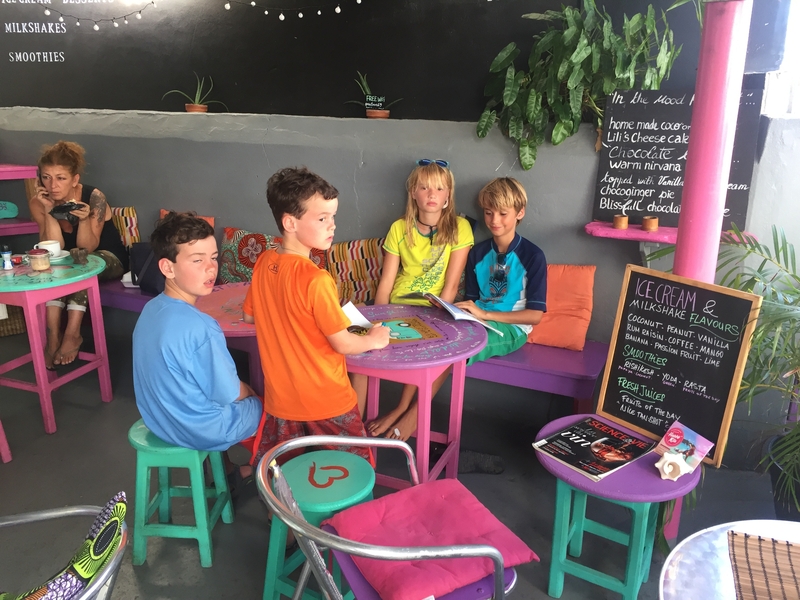 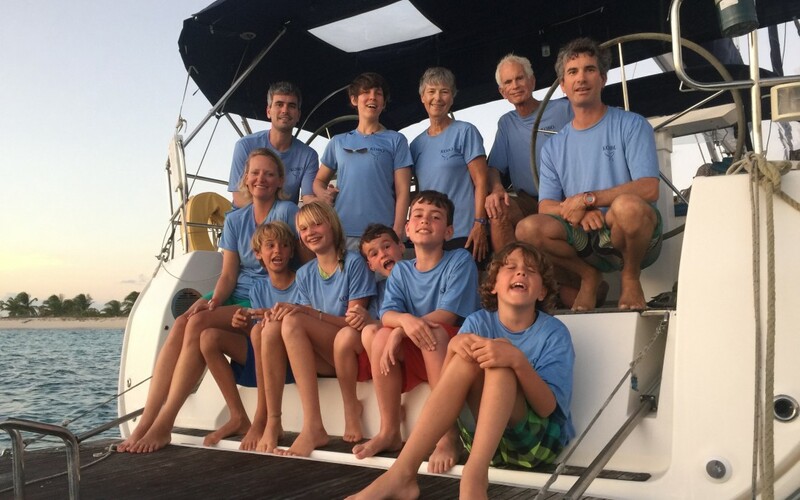 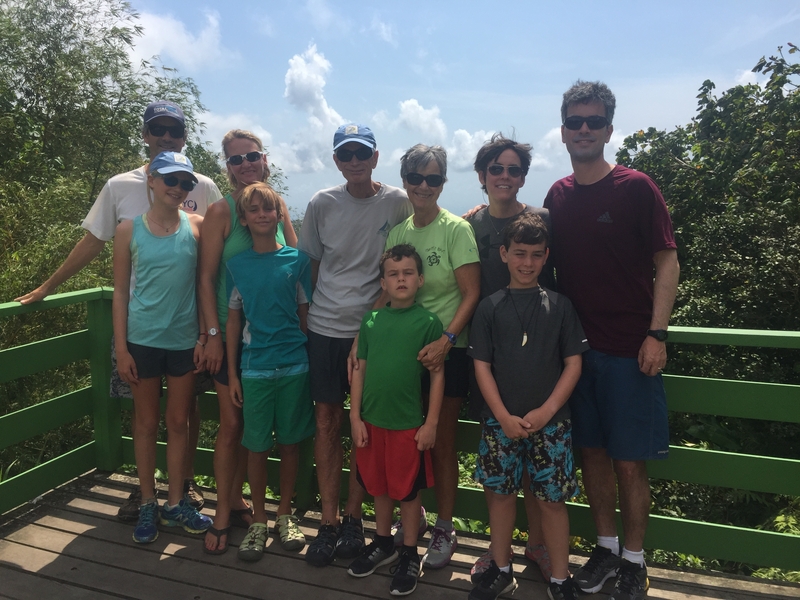 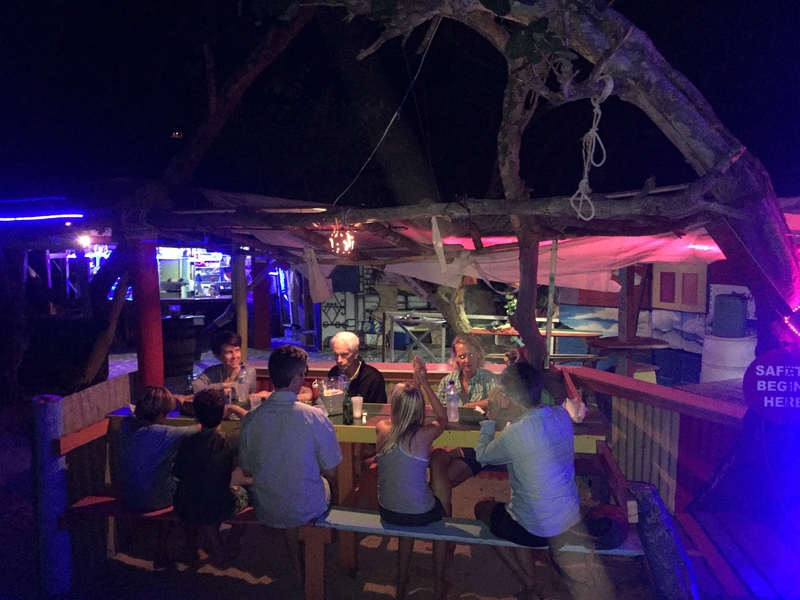 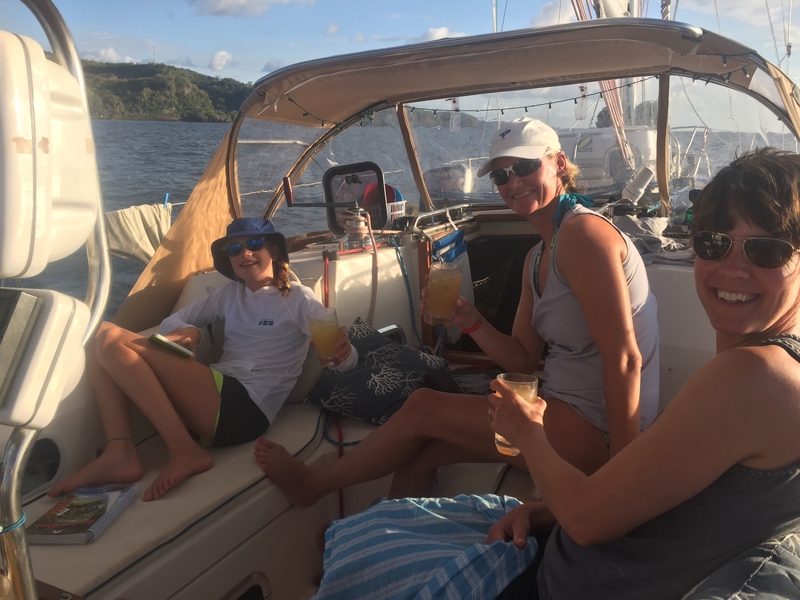 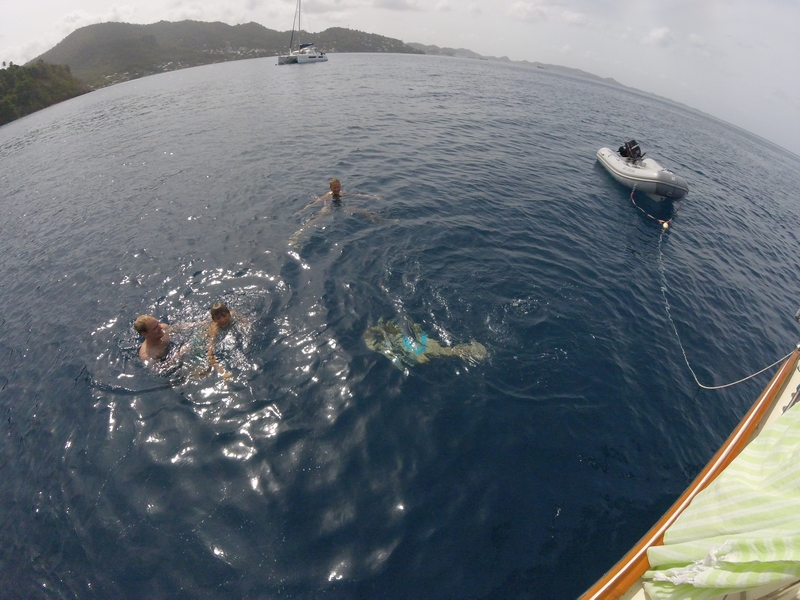 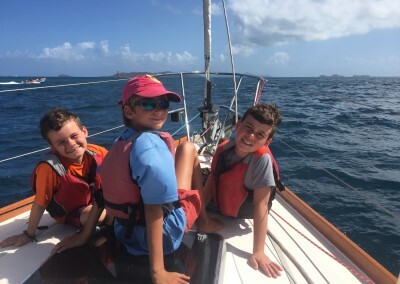 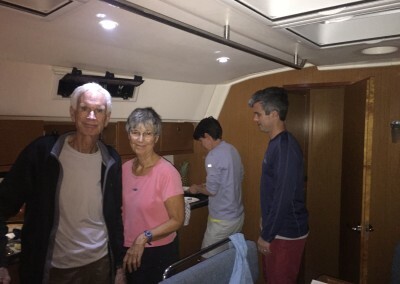 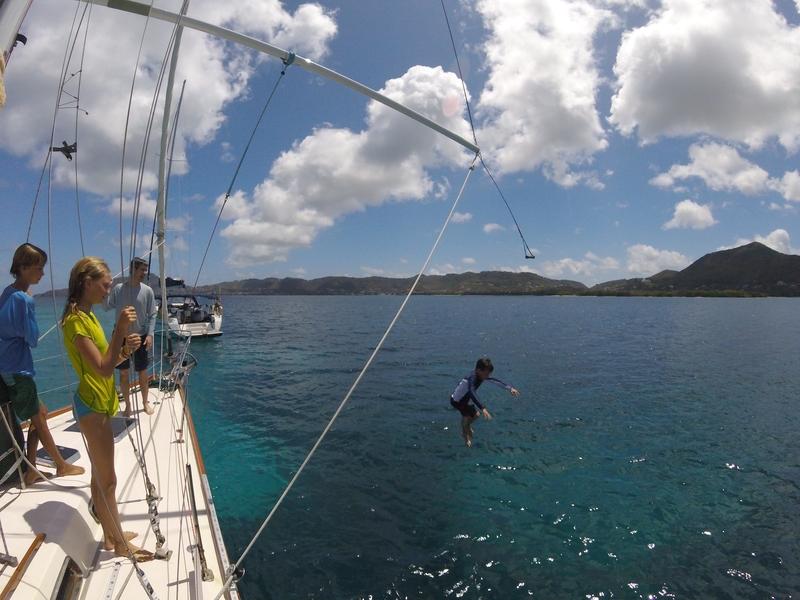 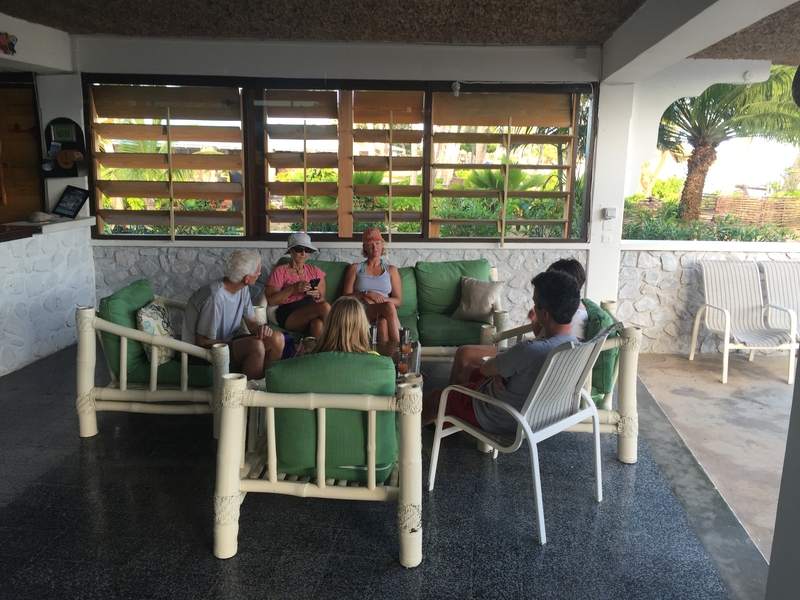 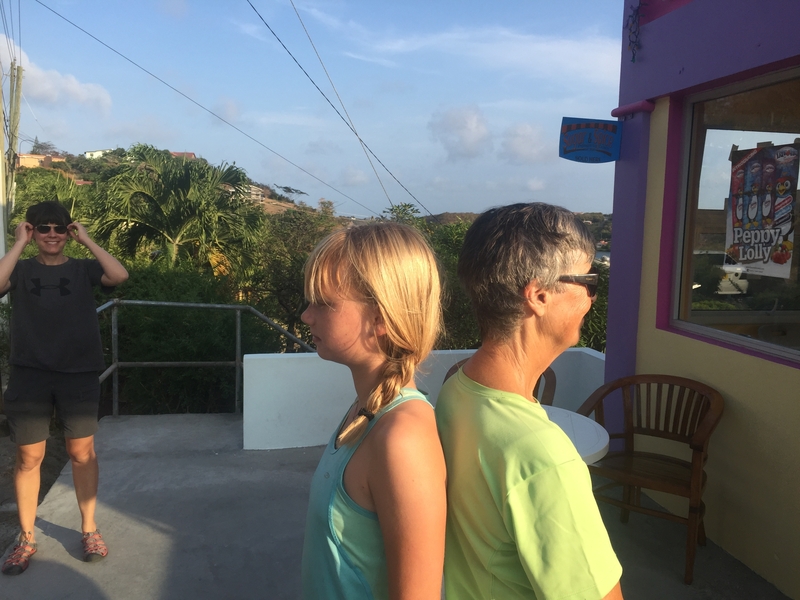 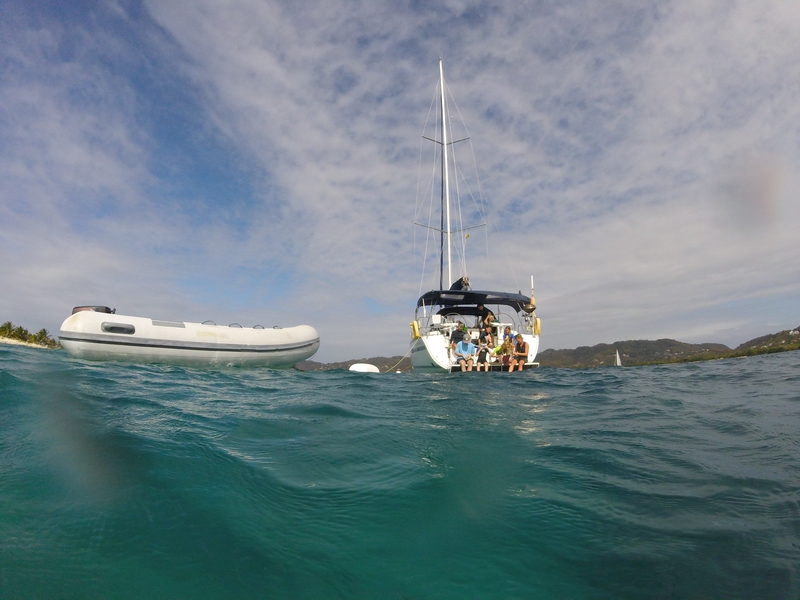 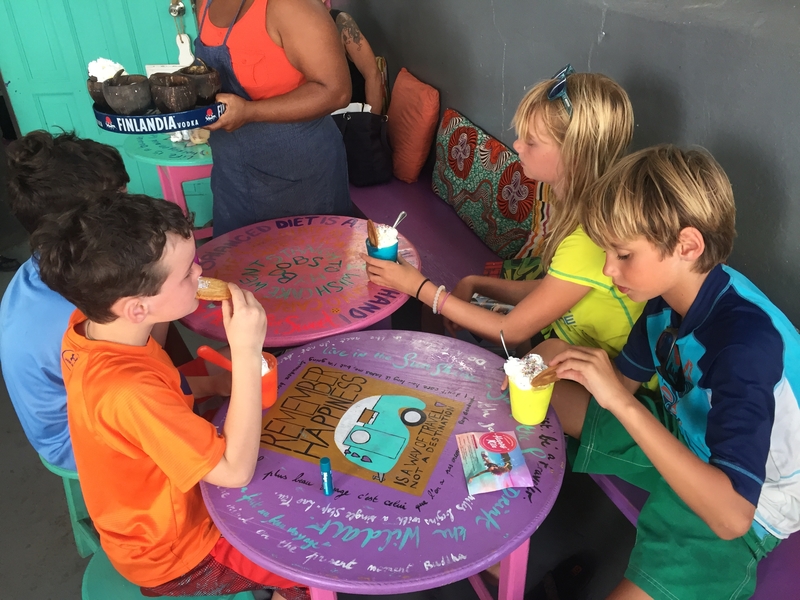 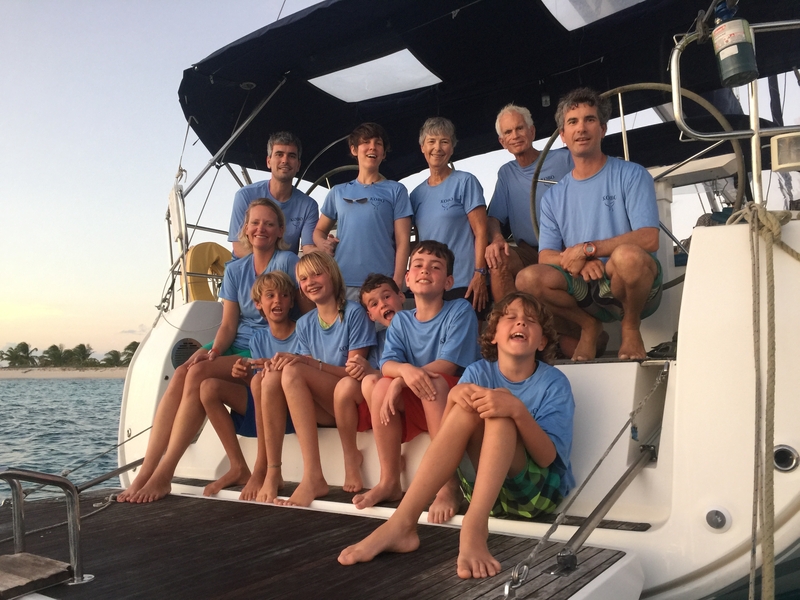 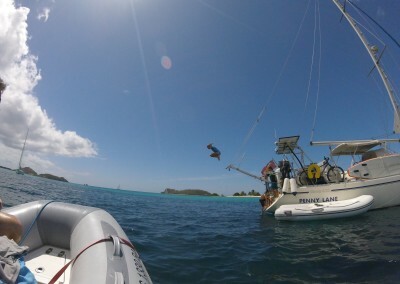 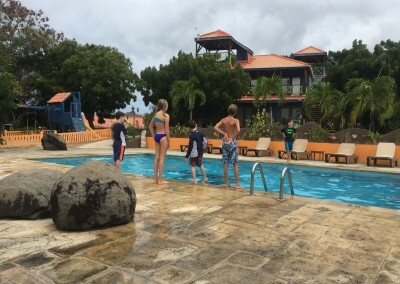 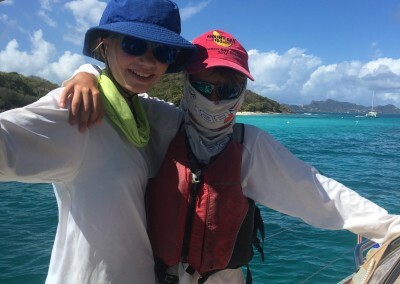 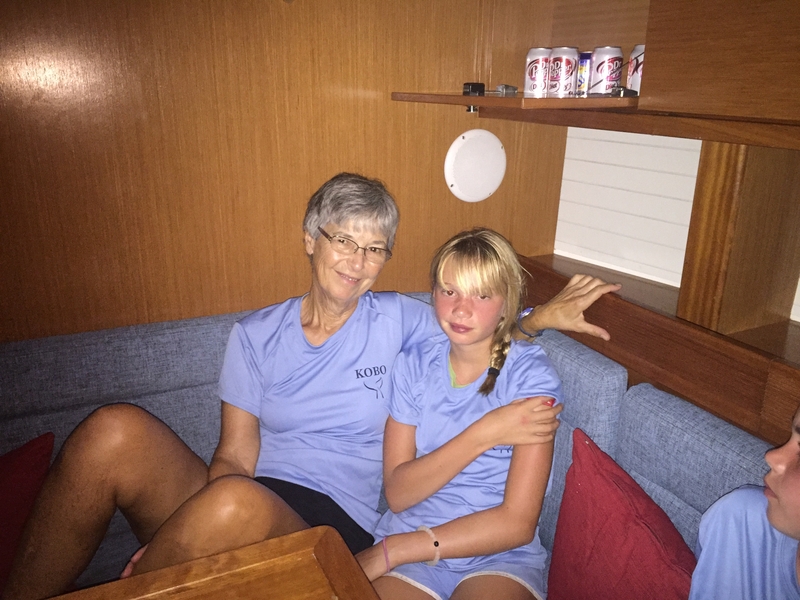 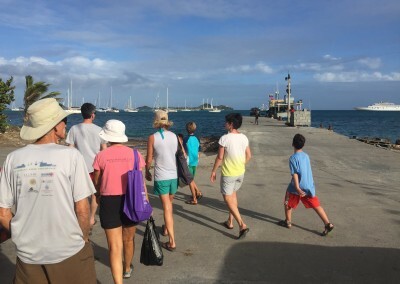 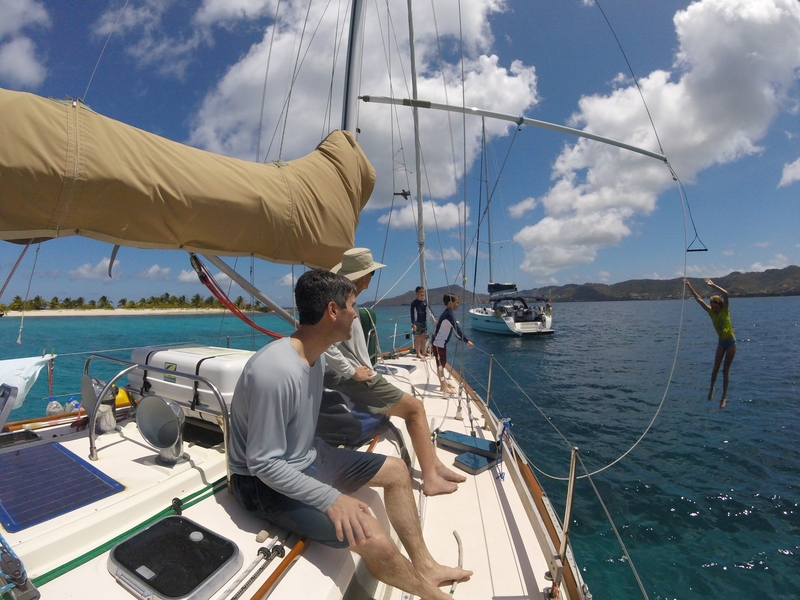 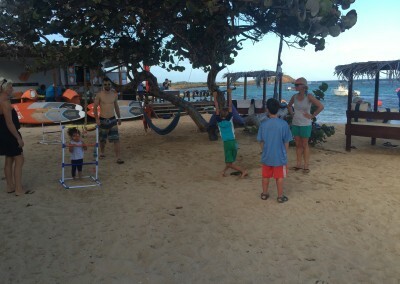 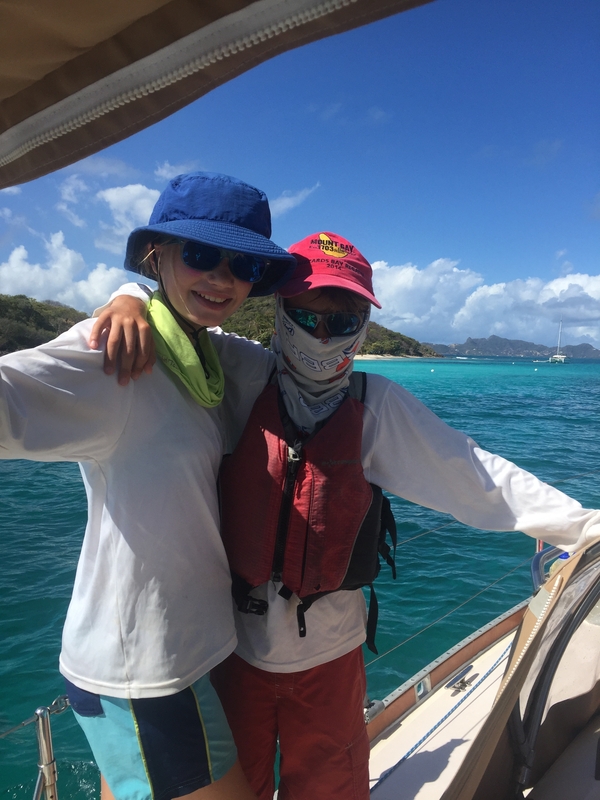 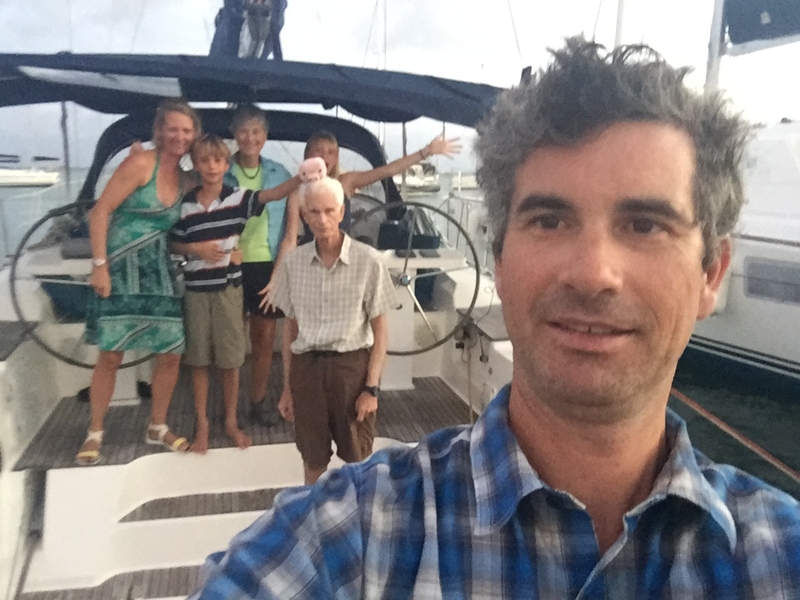 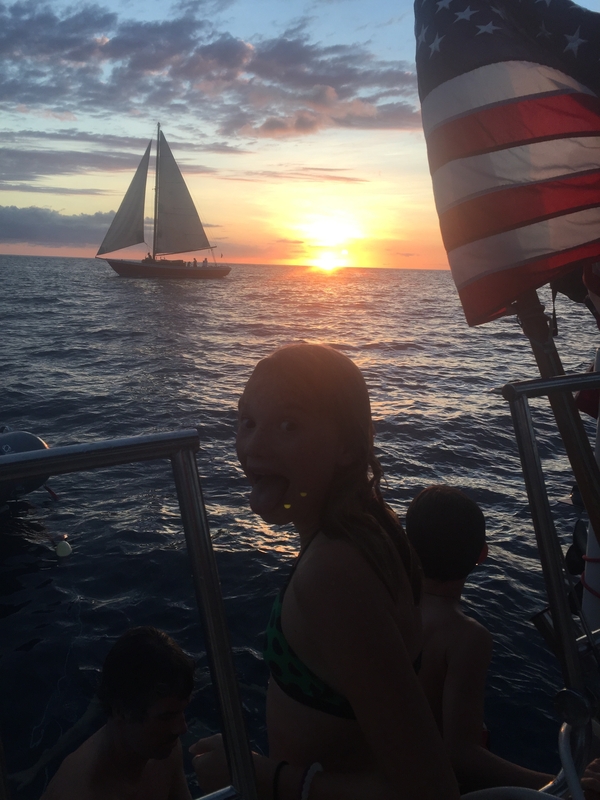 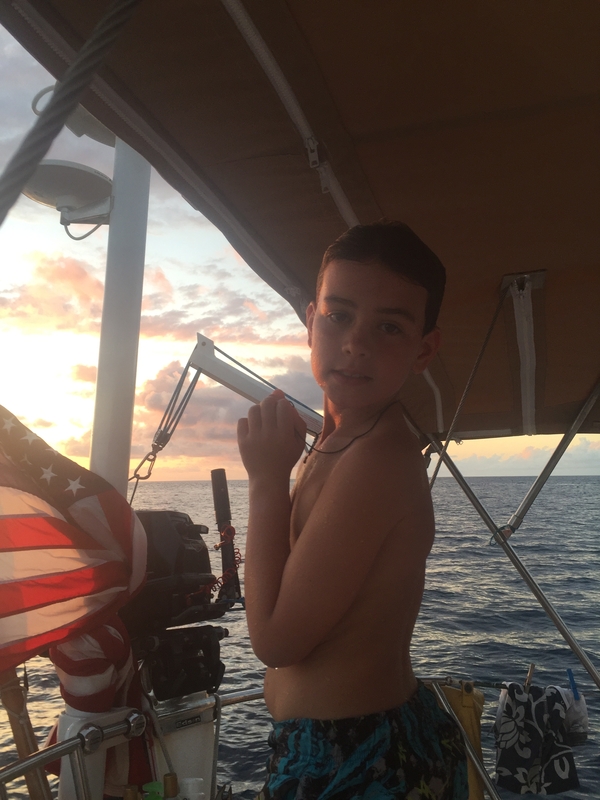 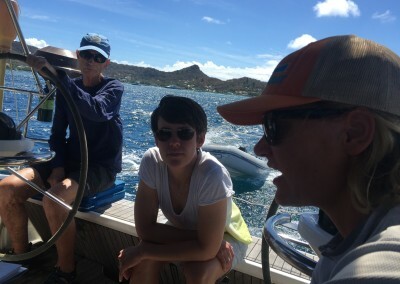 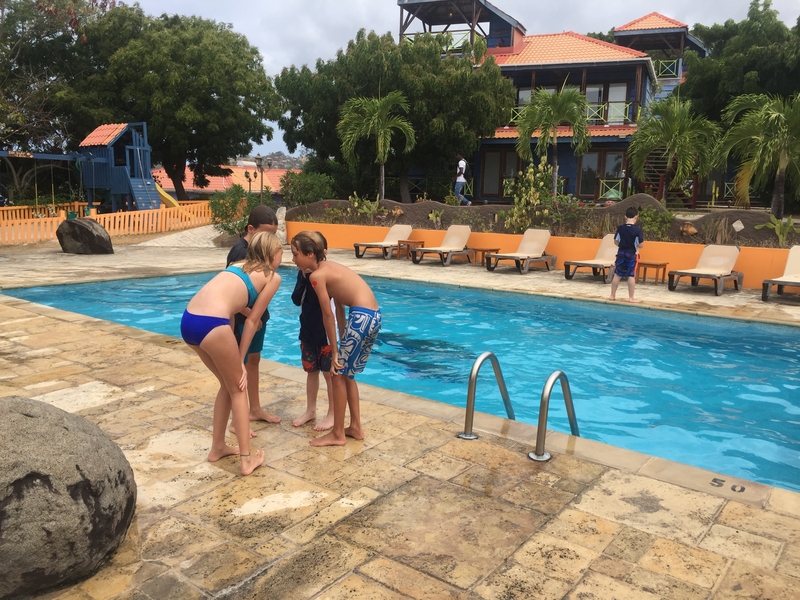 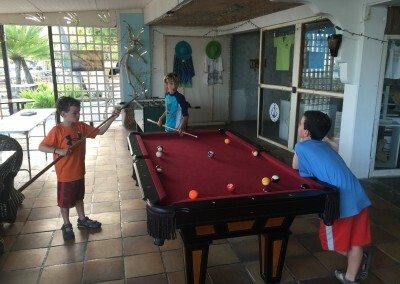 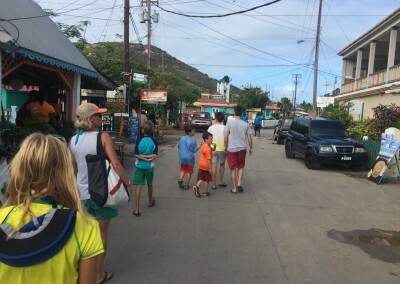 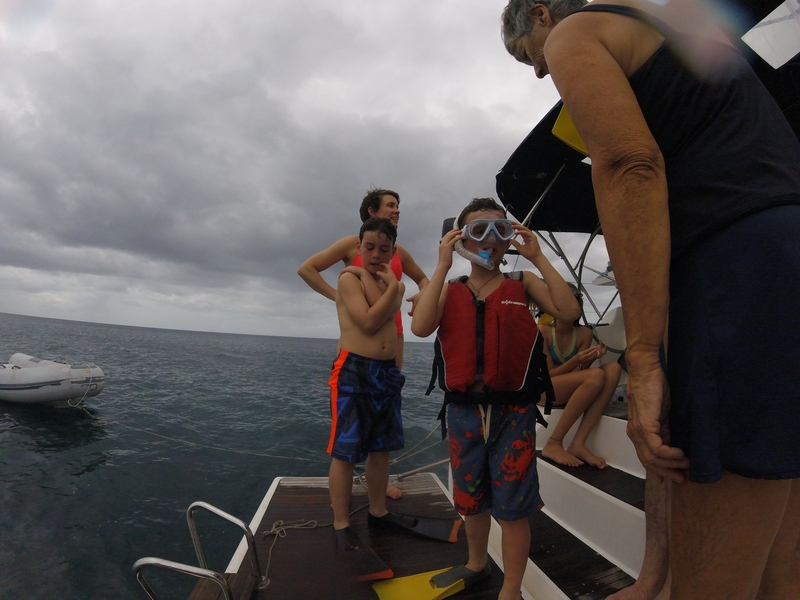 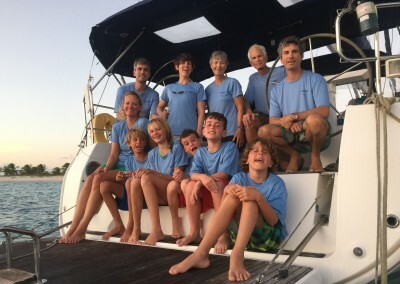 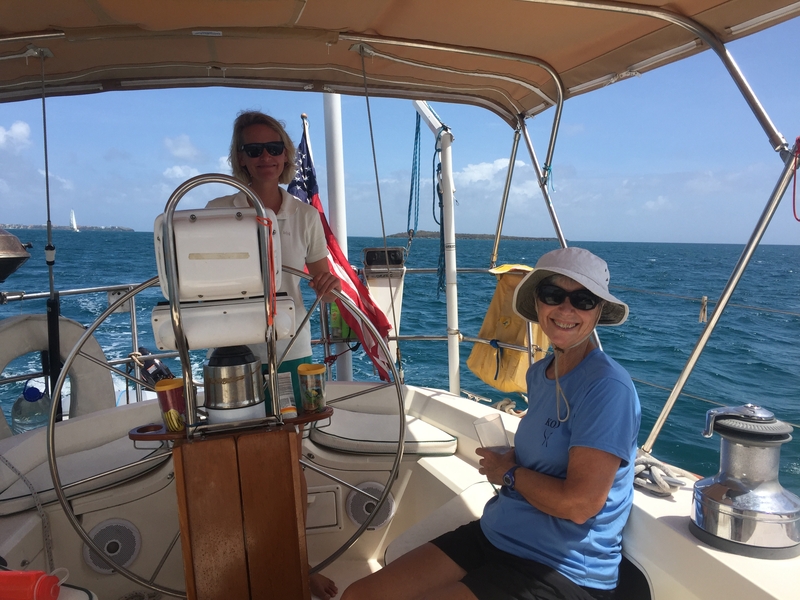 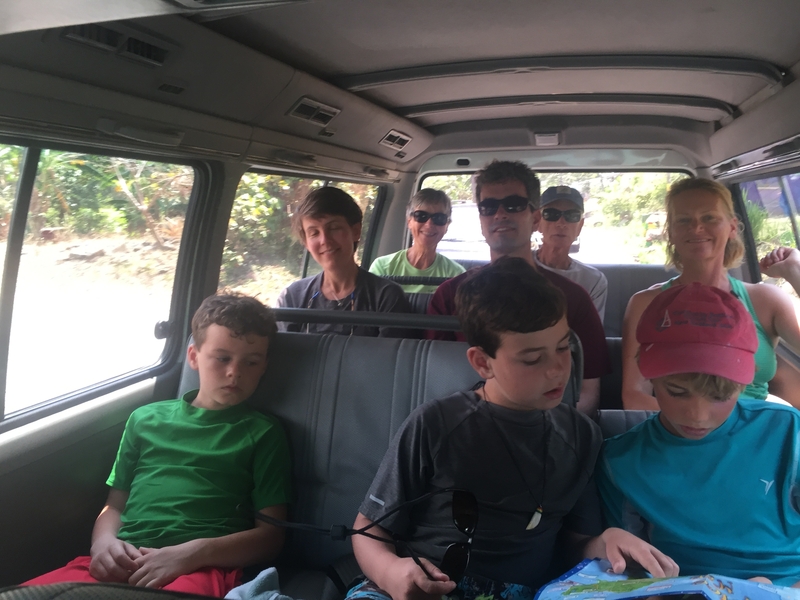 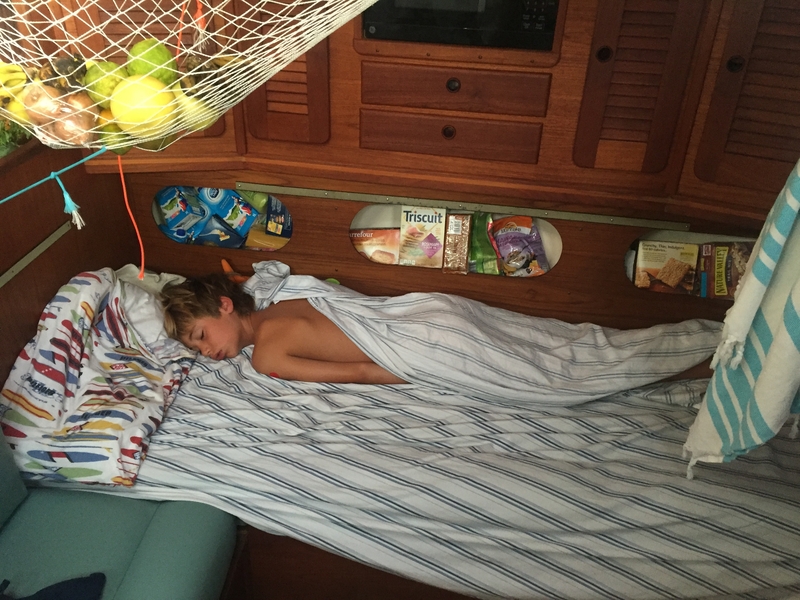 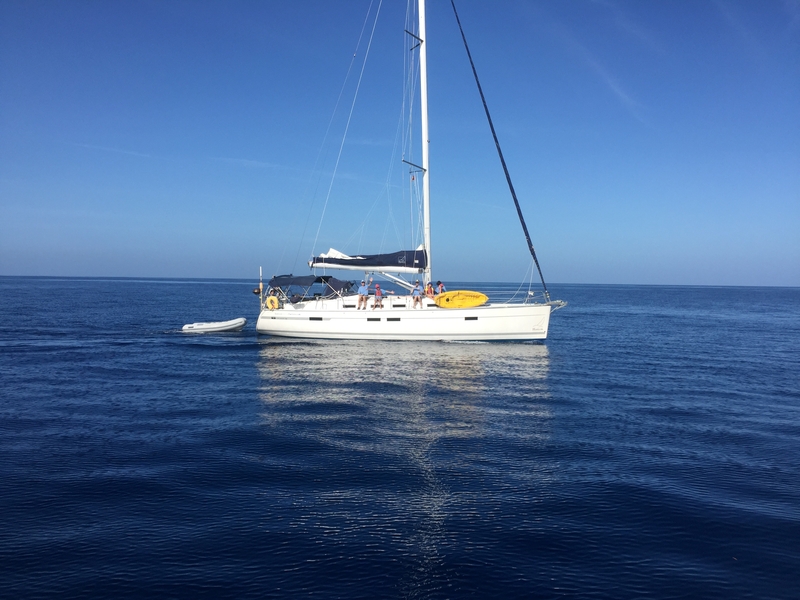 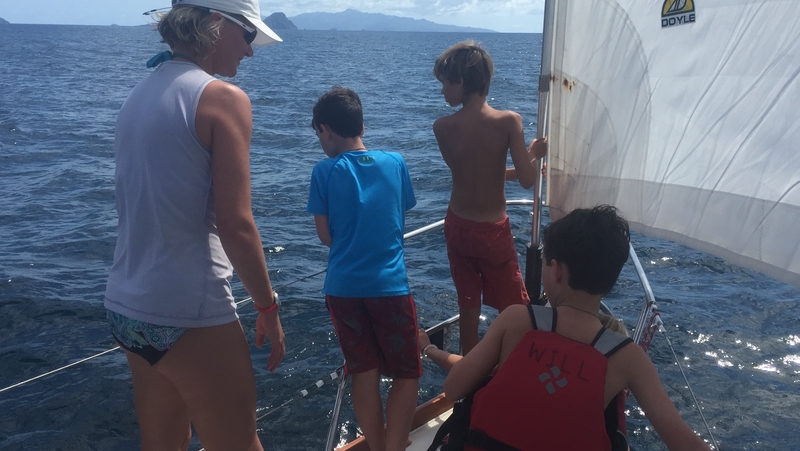 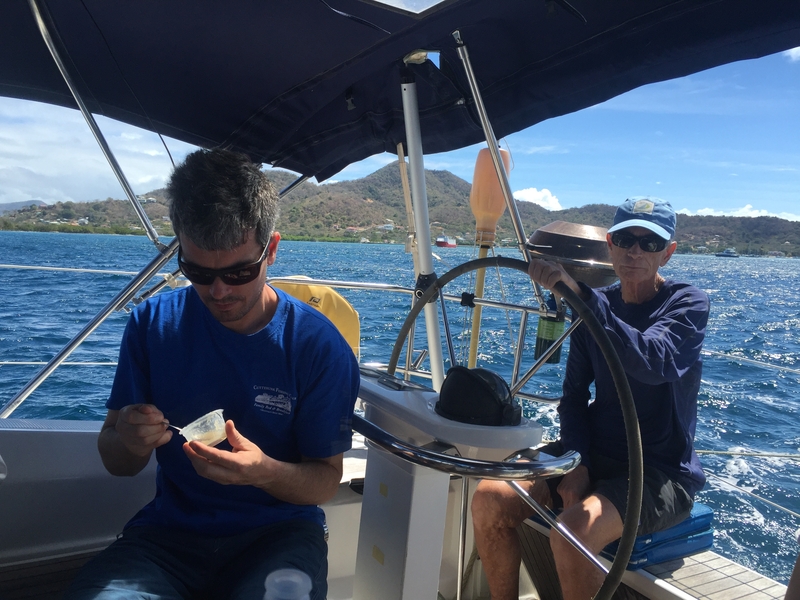 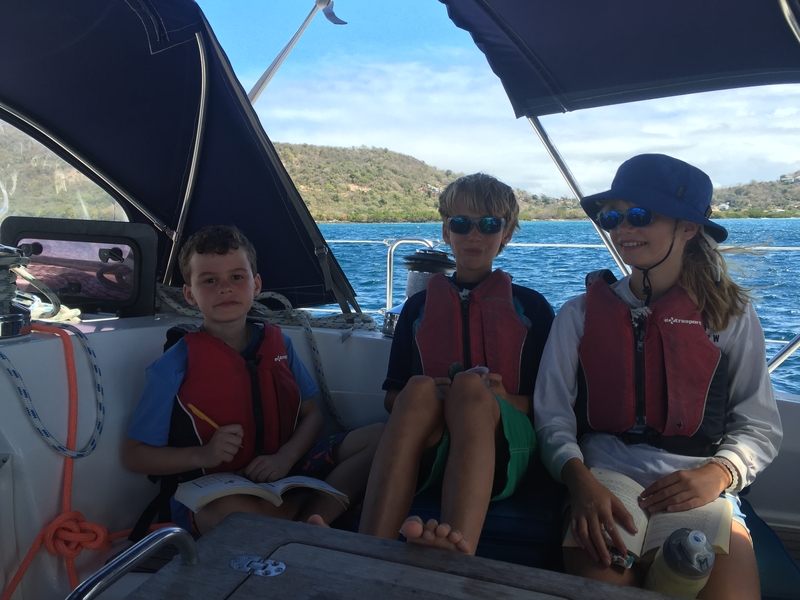 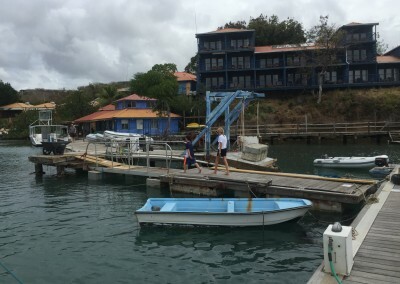 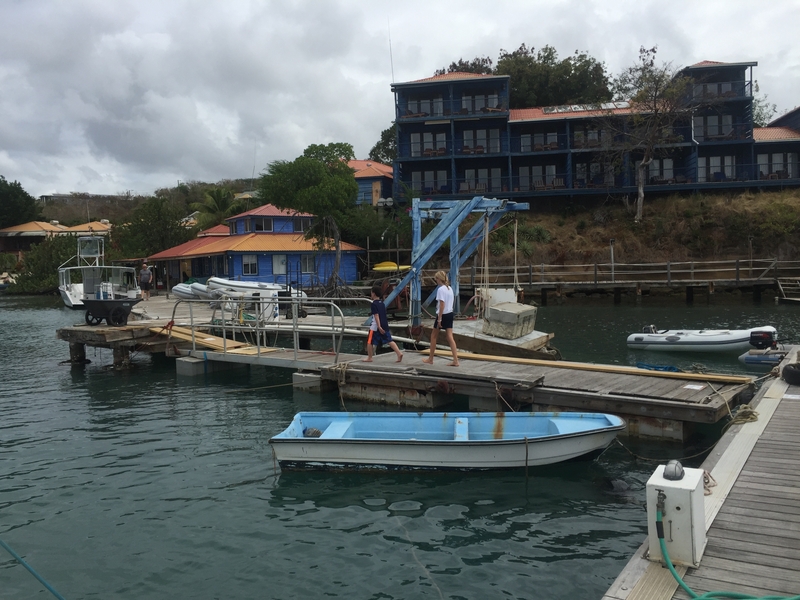 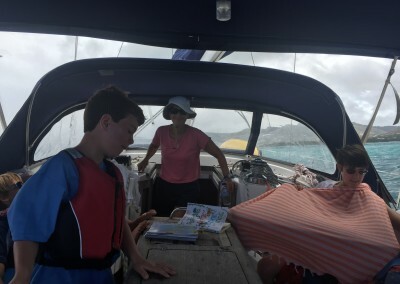 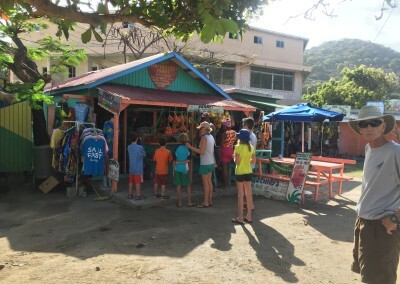 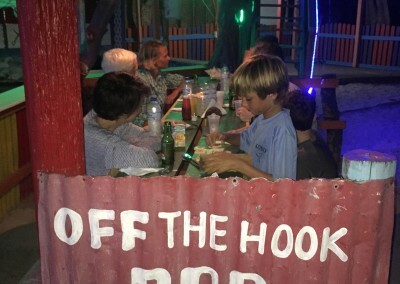 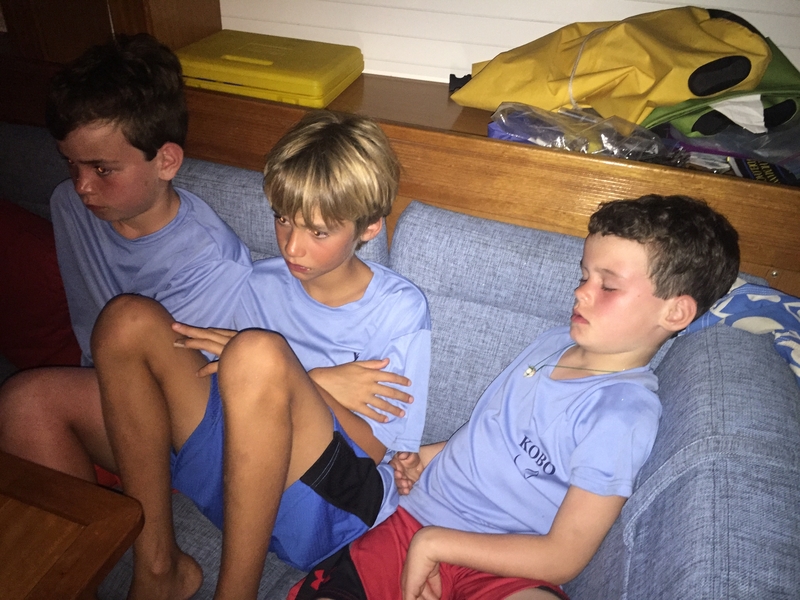 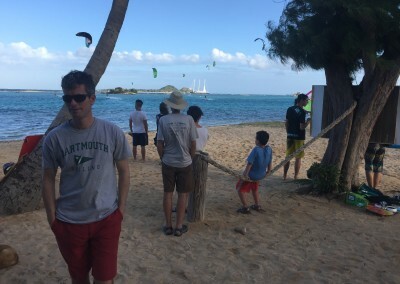 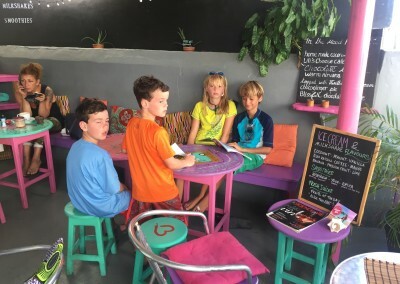 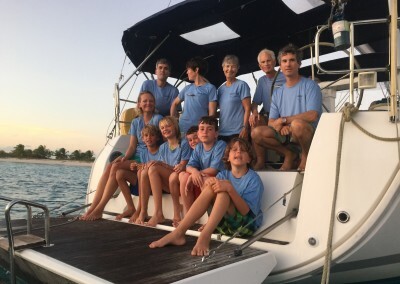 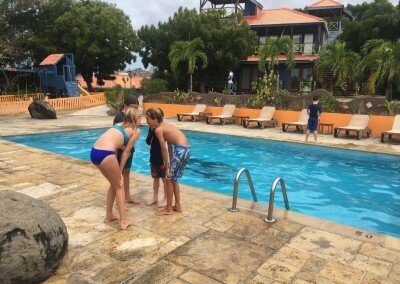 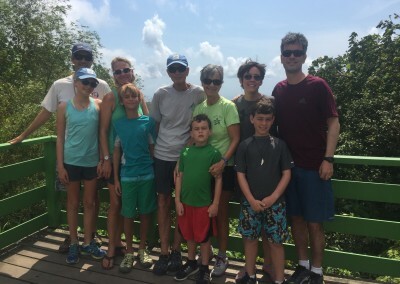 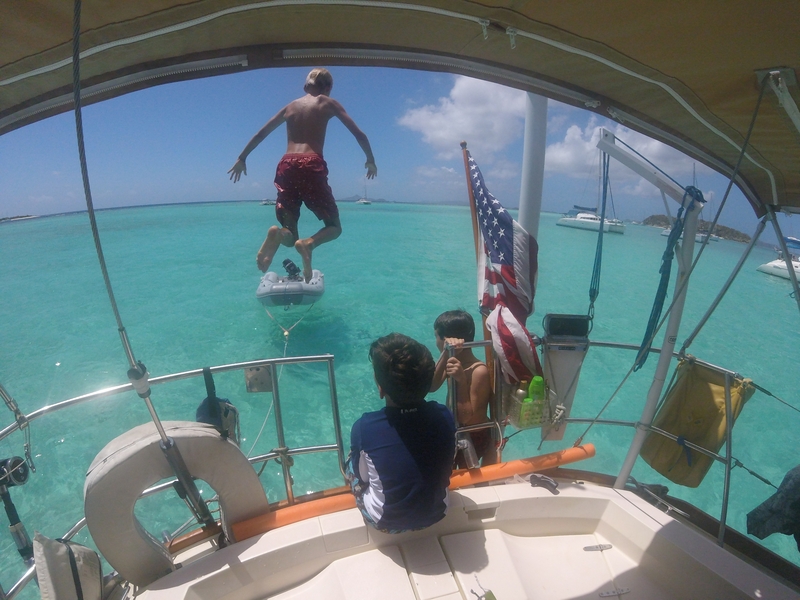 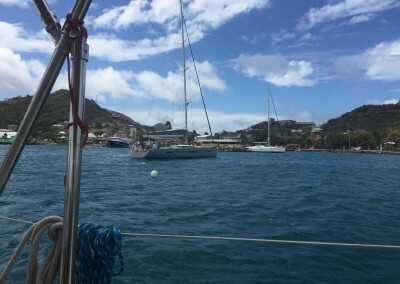 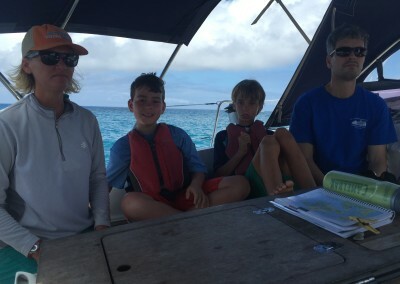 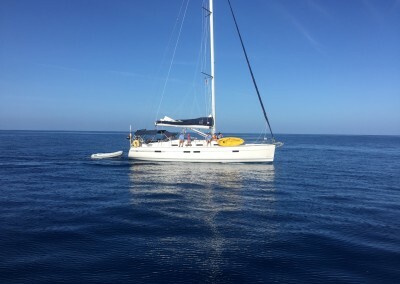 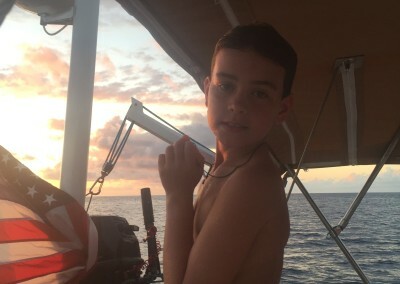 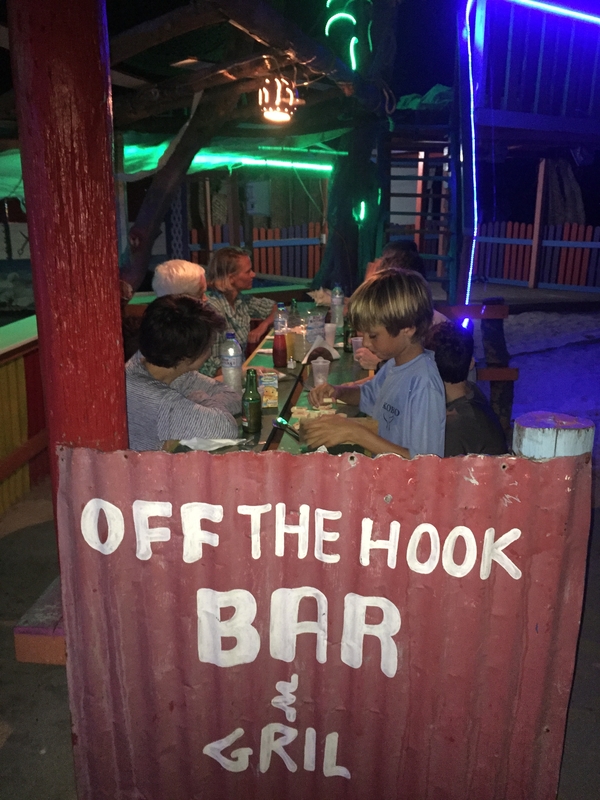 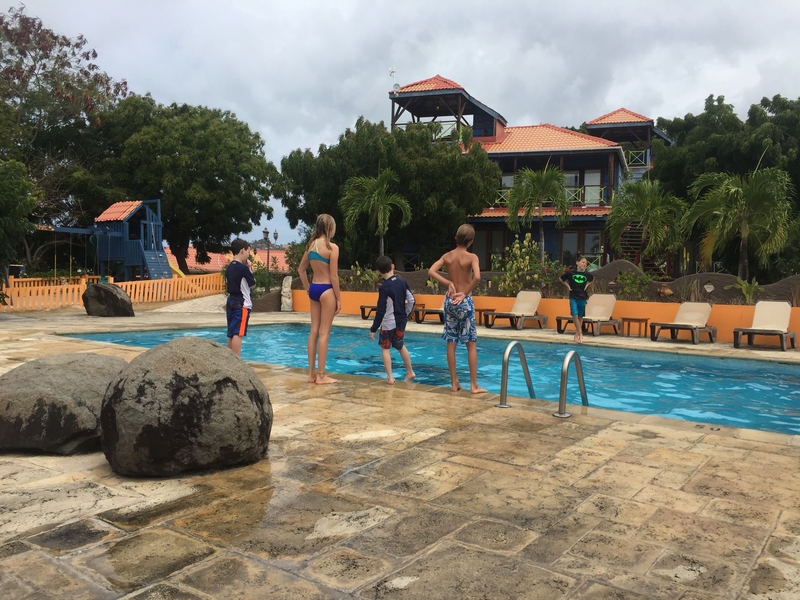 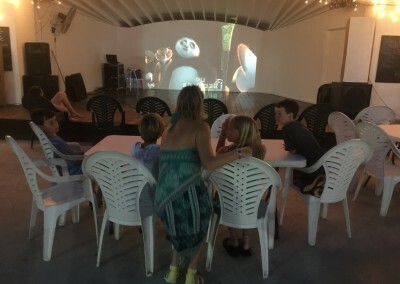 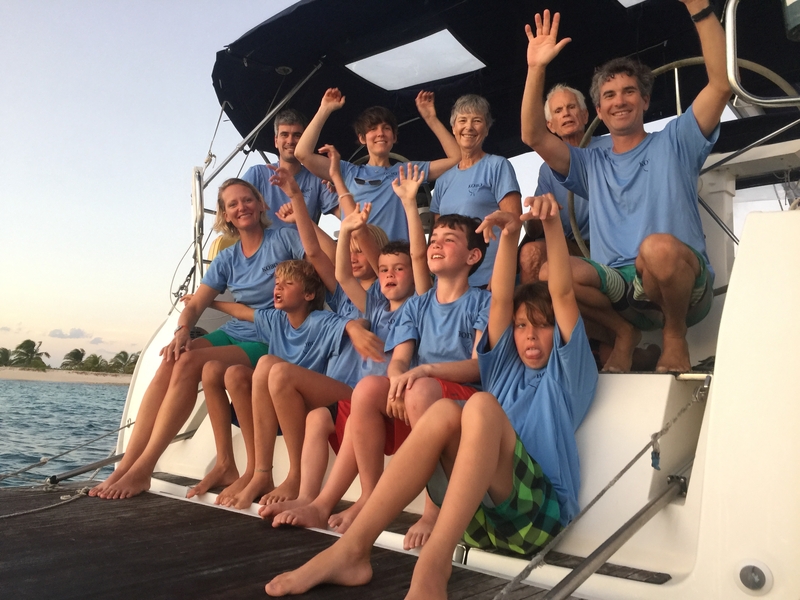 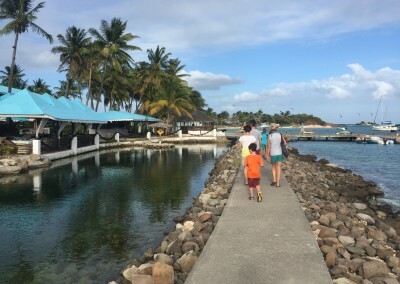 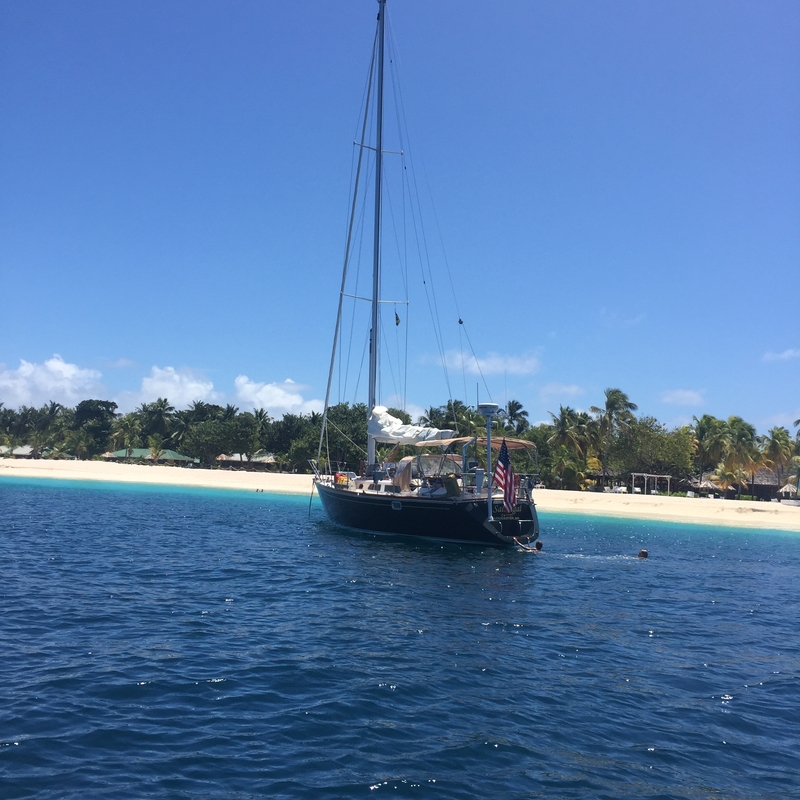 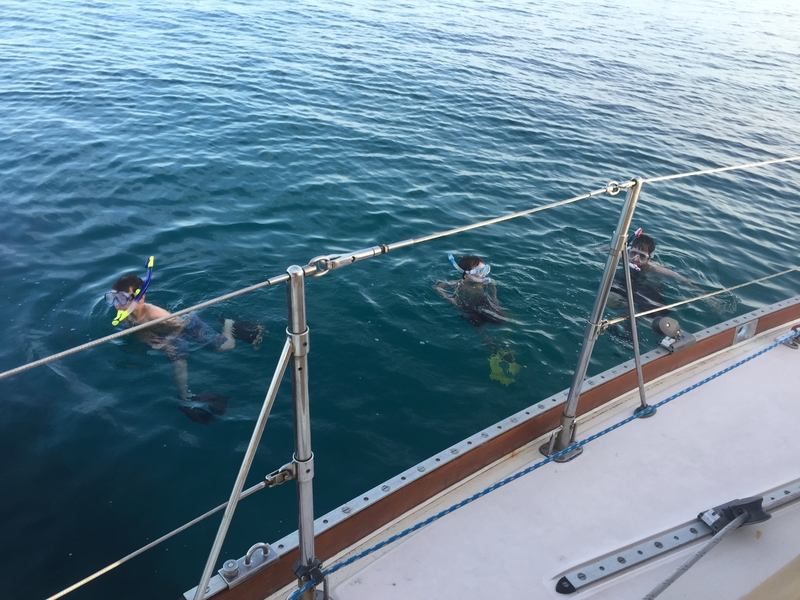 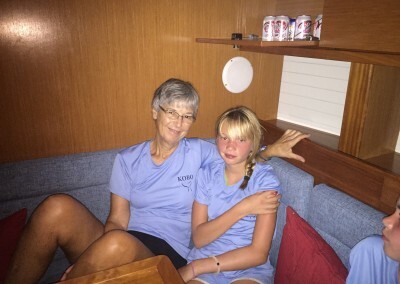 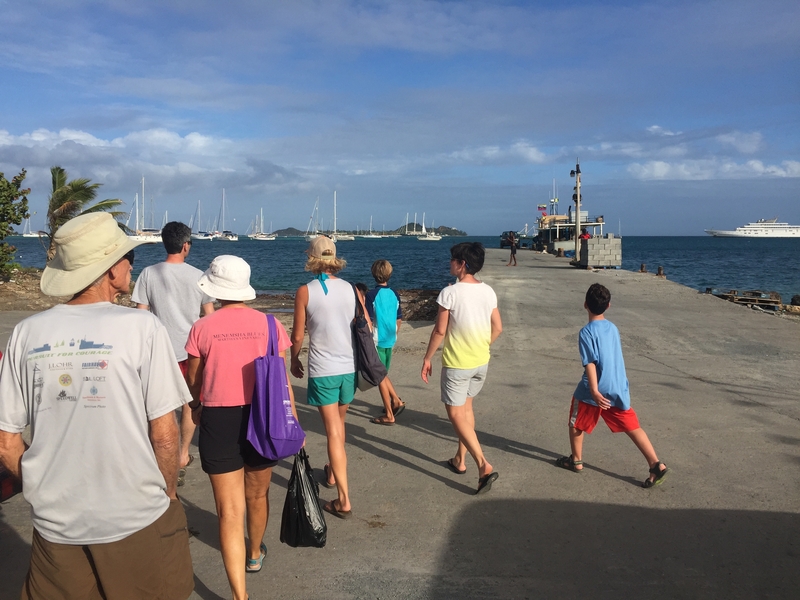 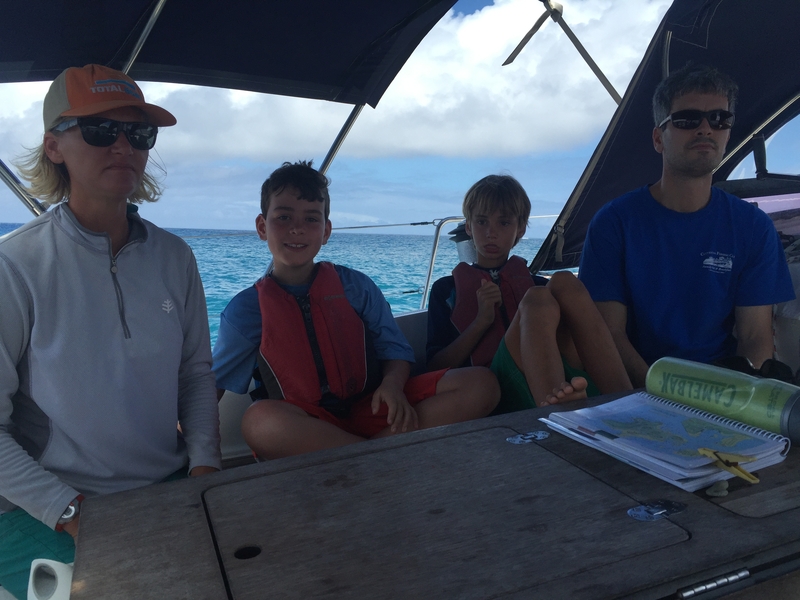 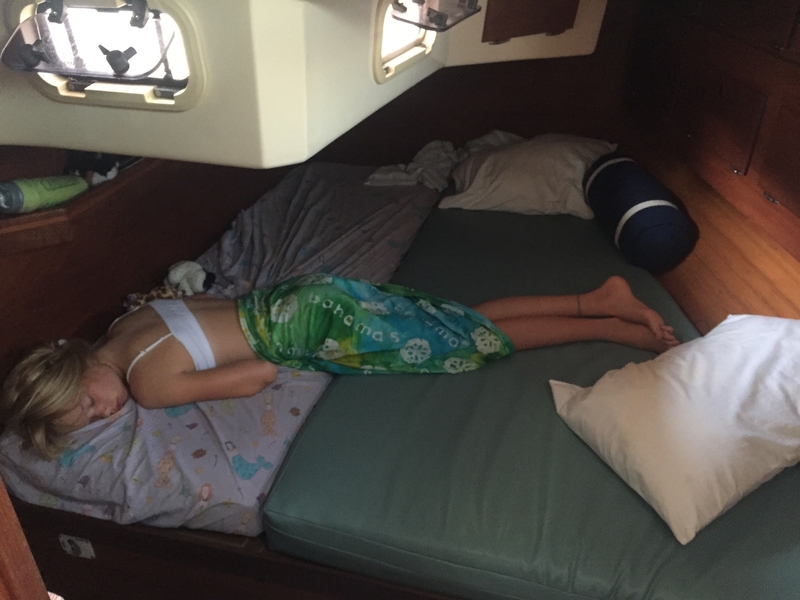 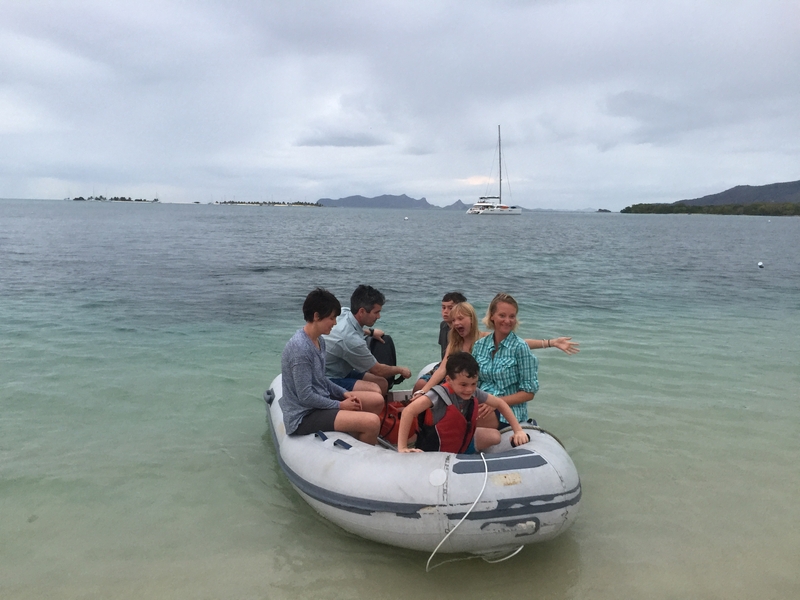 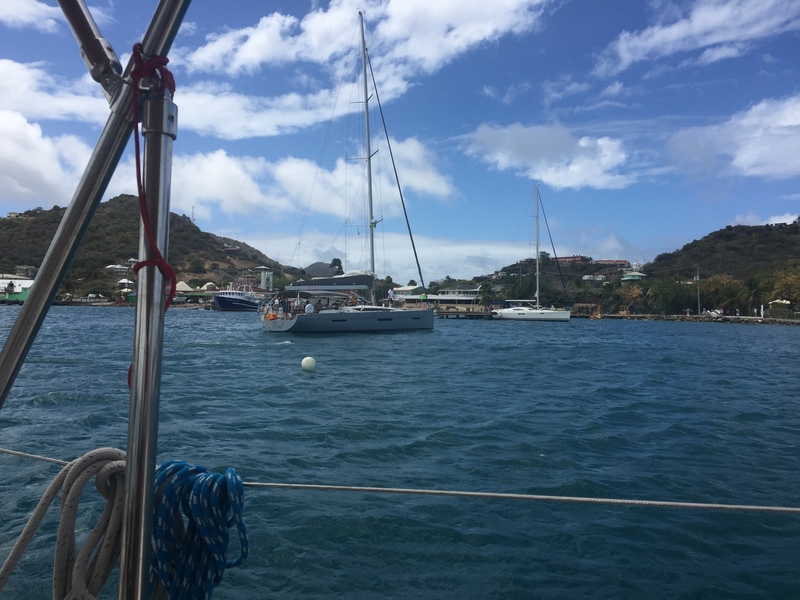 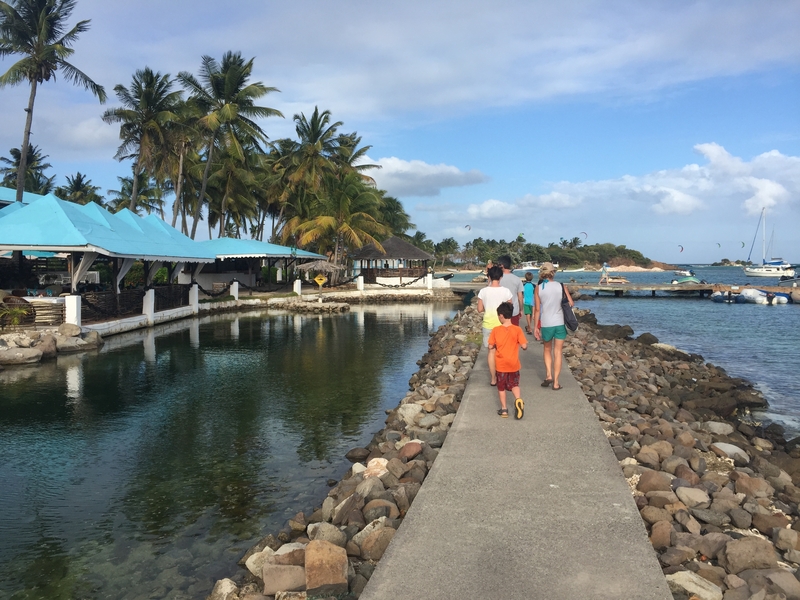 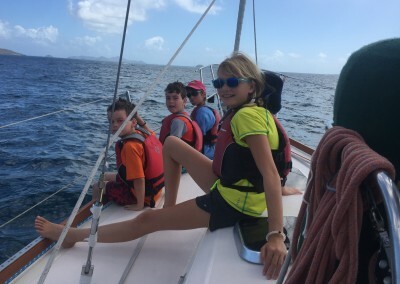 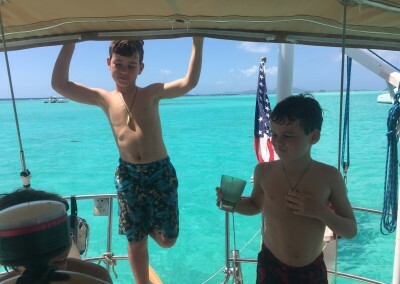 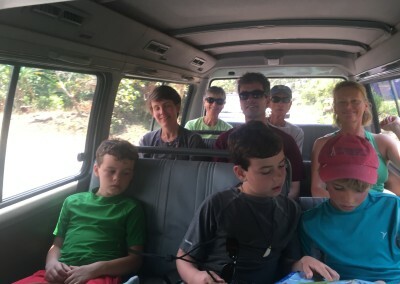 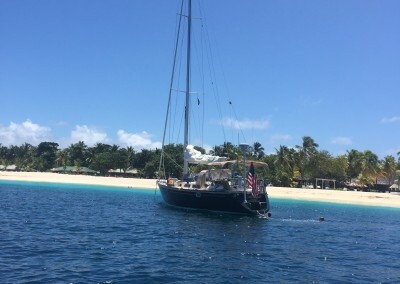 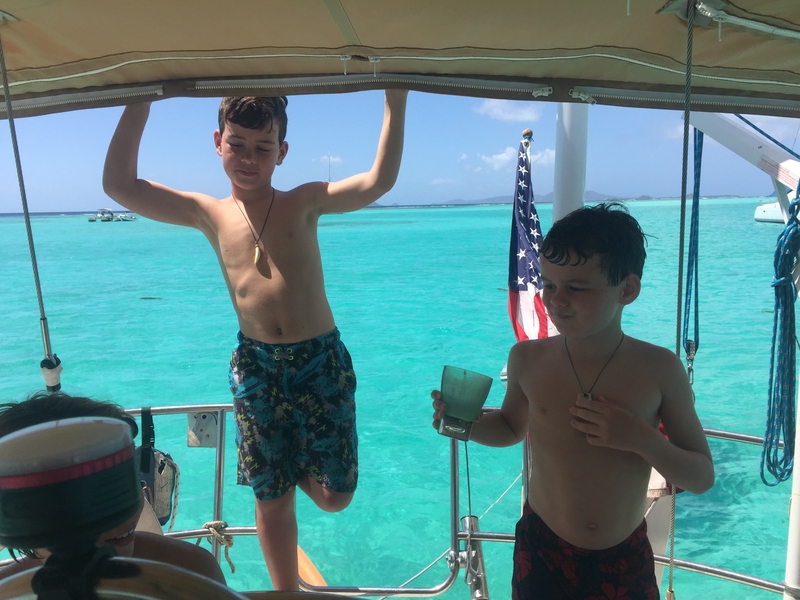 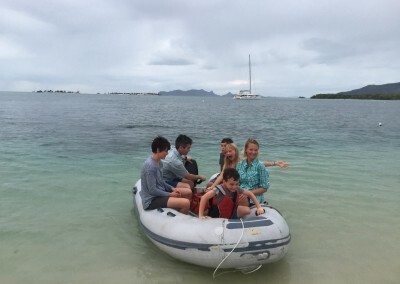 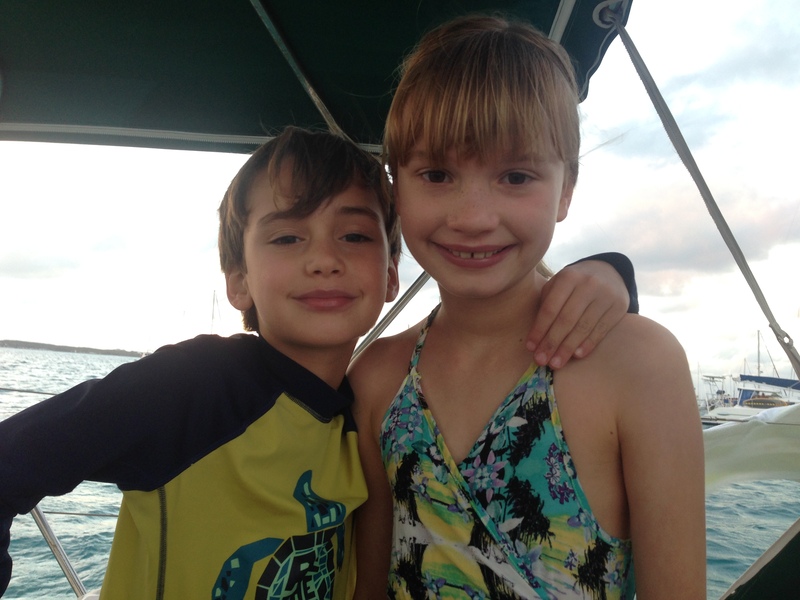 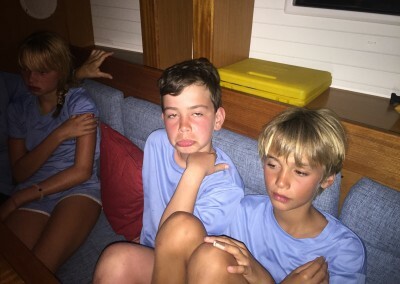 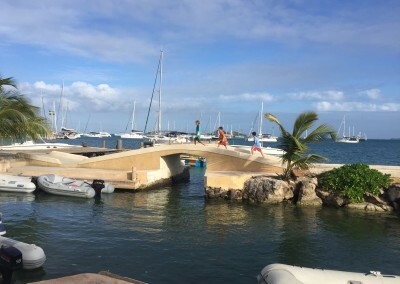 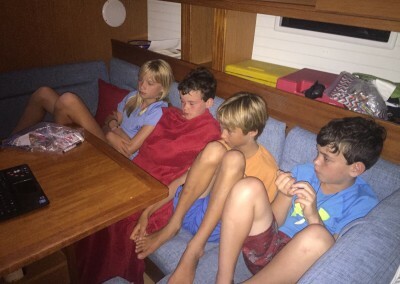 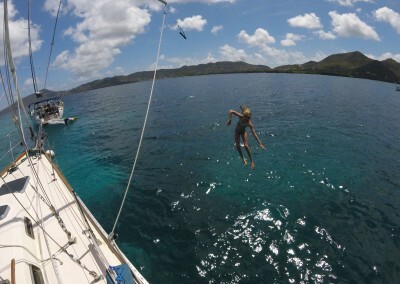 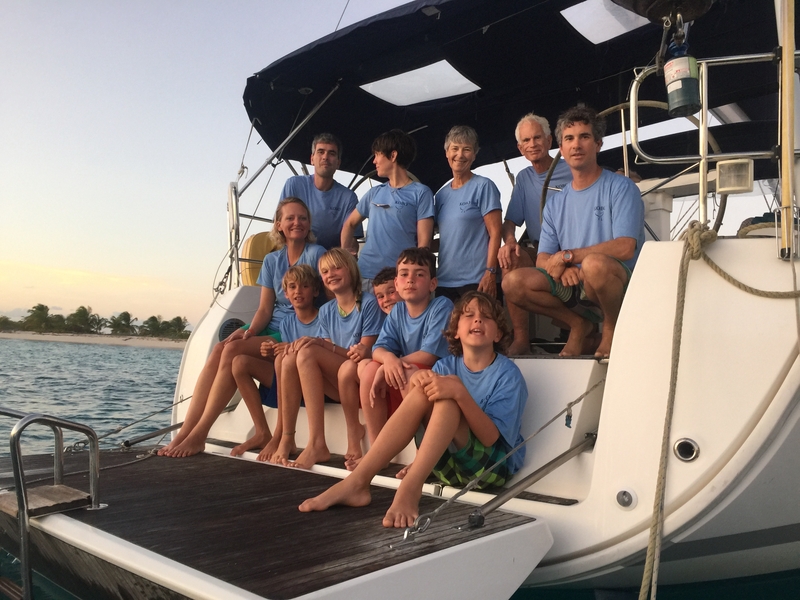 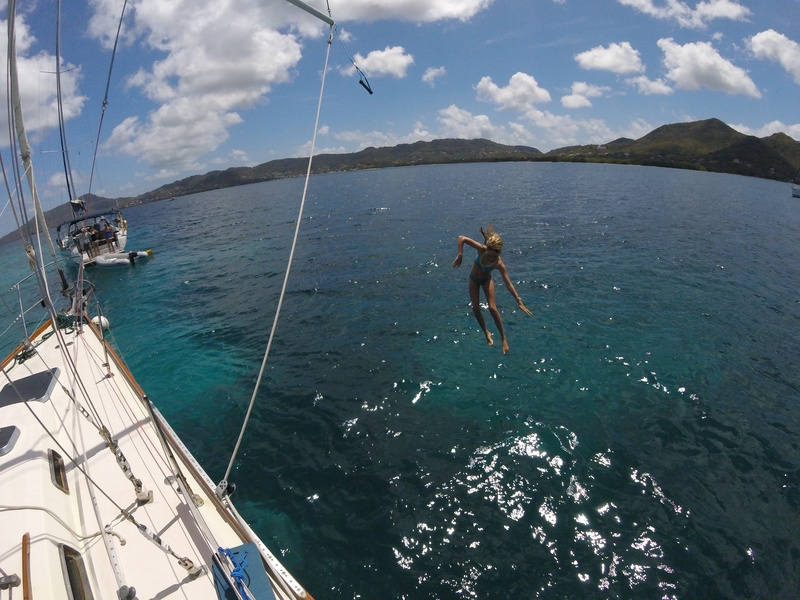 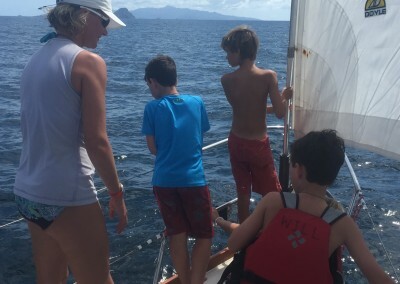 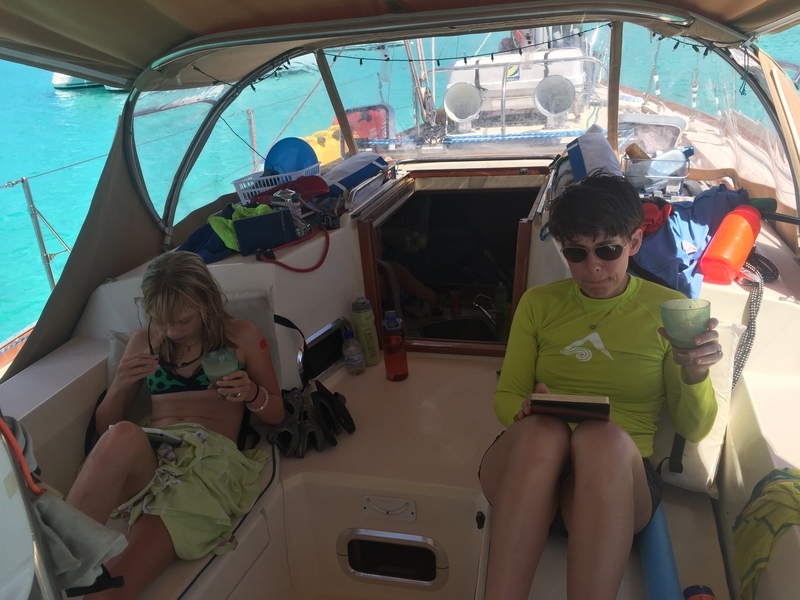 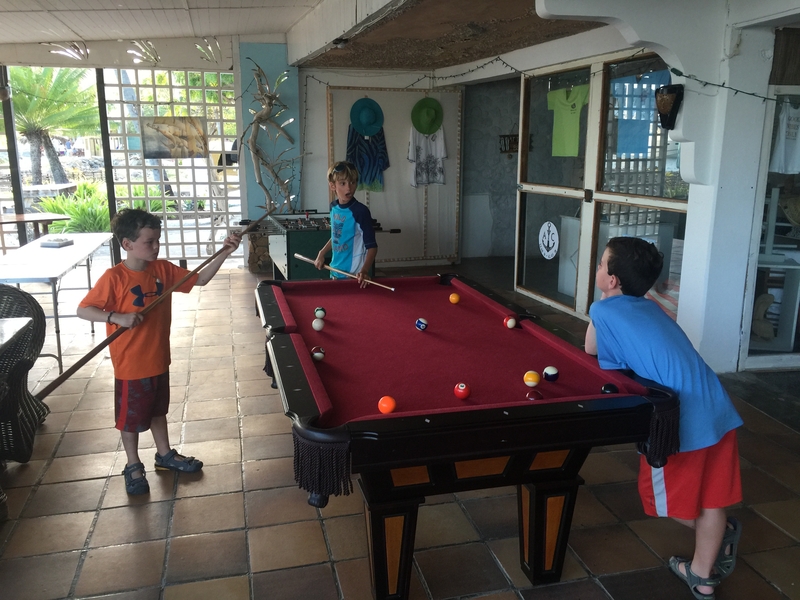 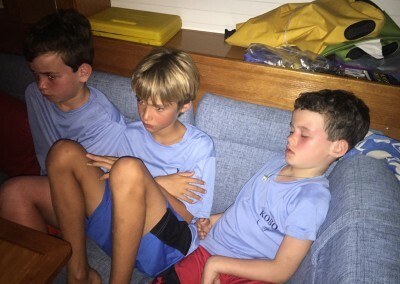 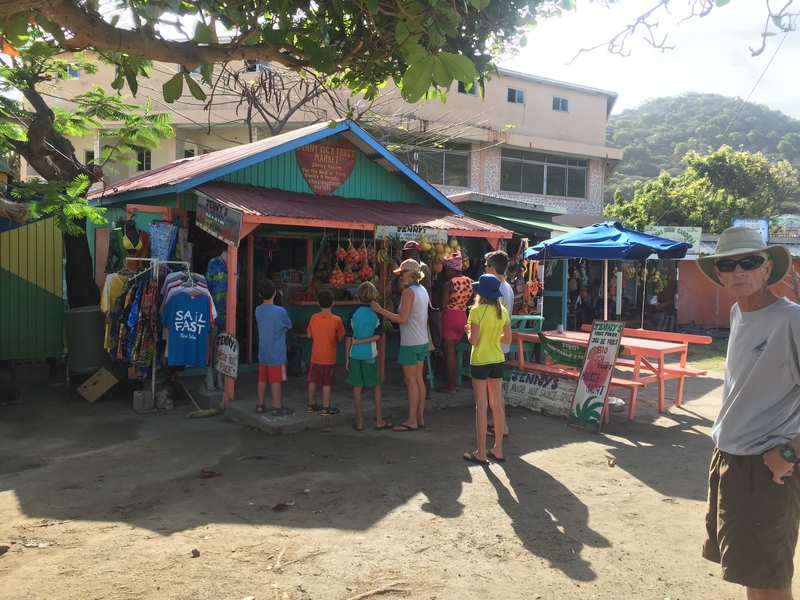 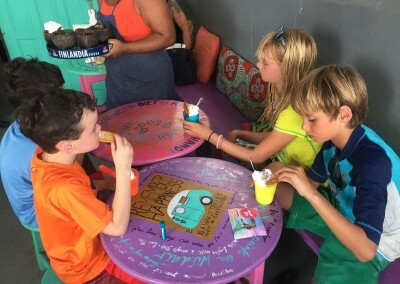 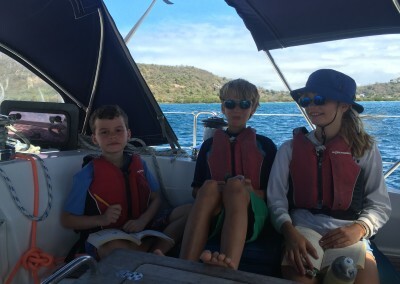 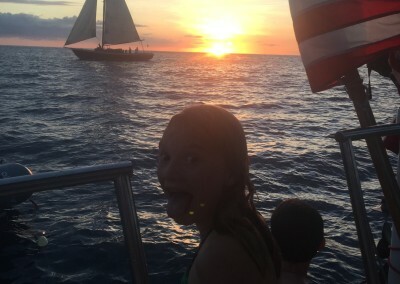 On Sunday, March 6th, Ted and Judy (Papa and Grammy) and Dan, Alice, Charles, and Will all arrived to True Blue Marina on the south end of Grenada where they had chartered a boat for the next 10 days. 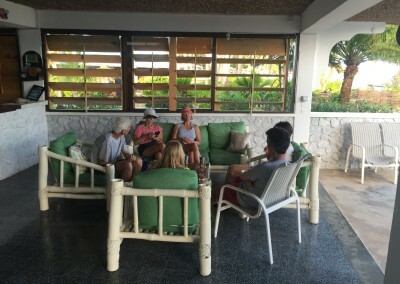 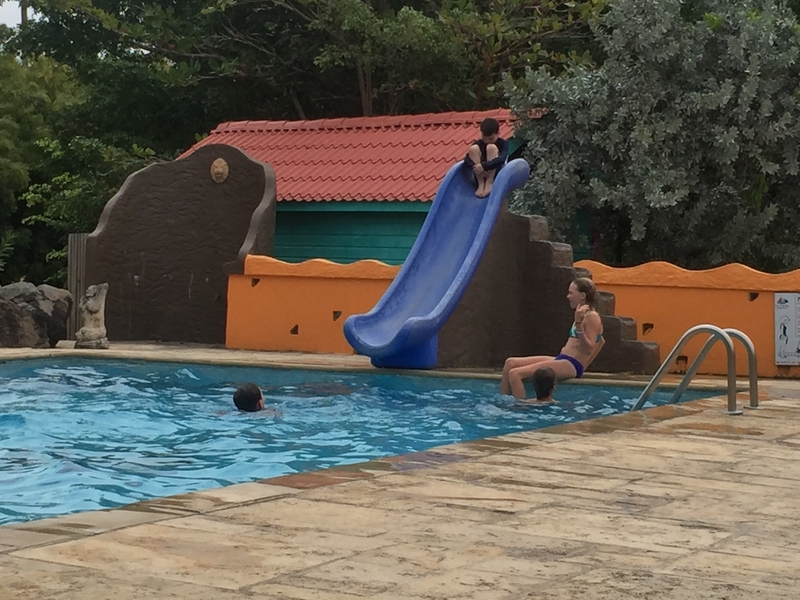 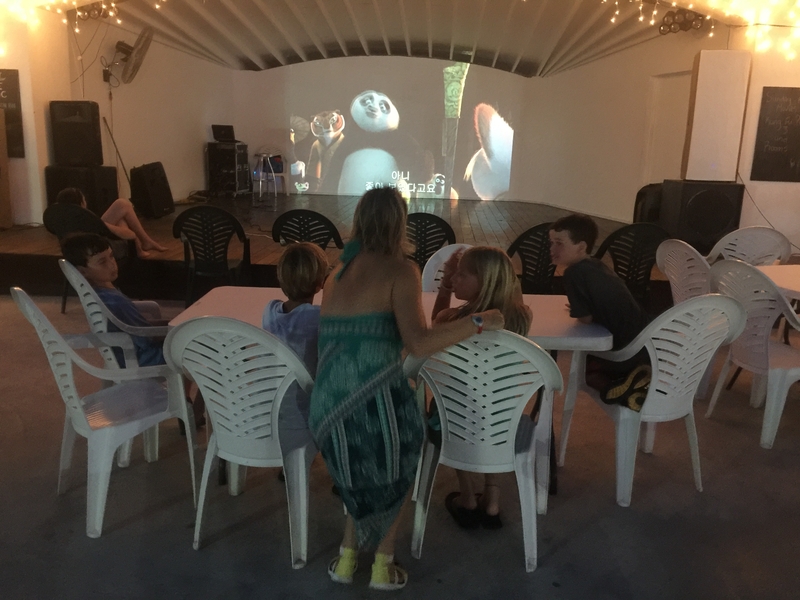 Talk about going from no family to some serious family time! 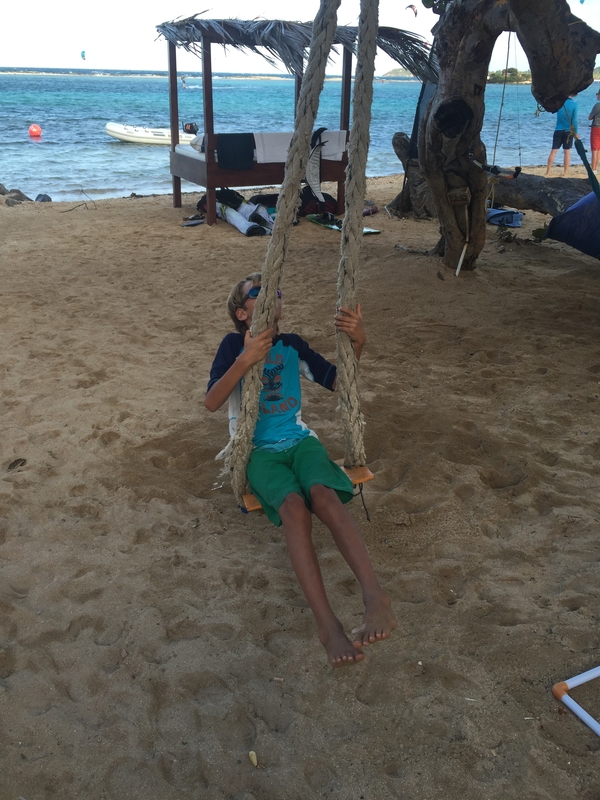 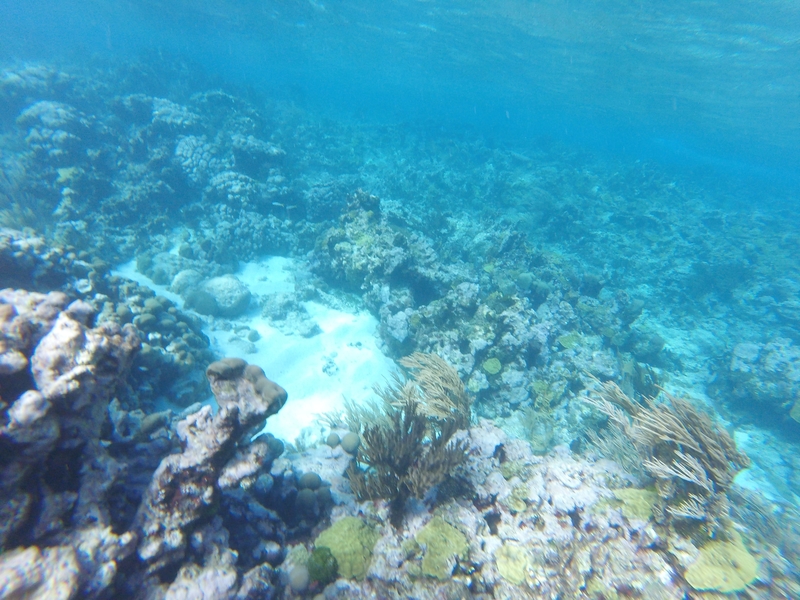 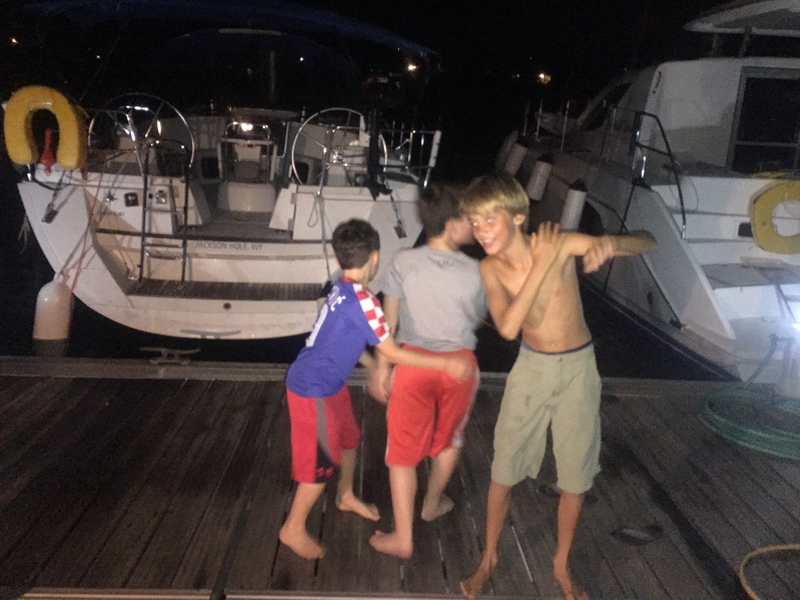 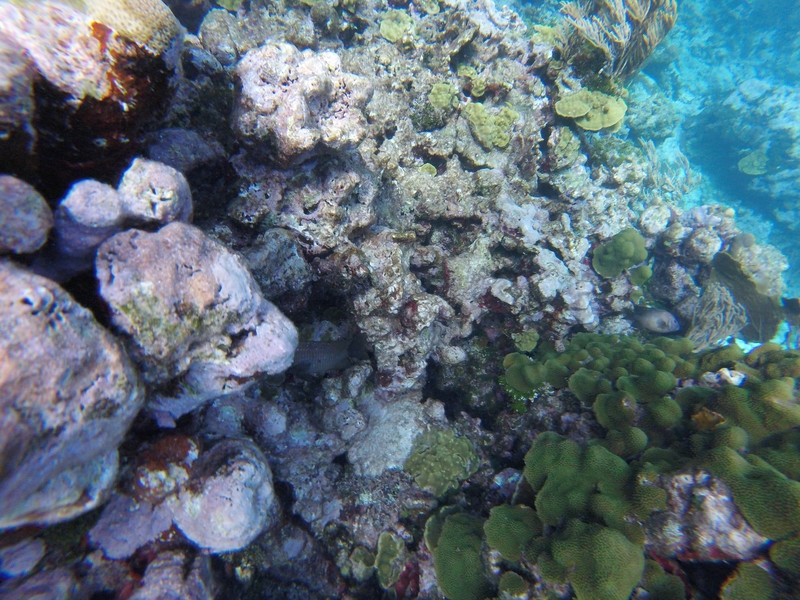 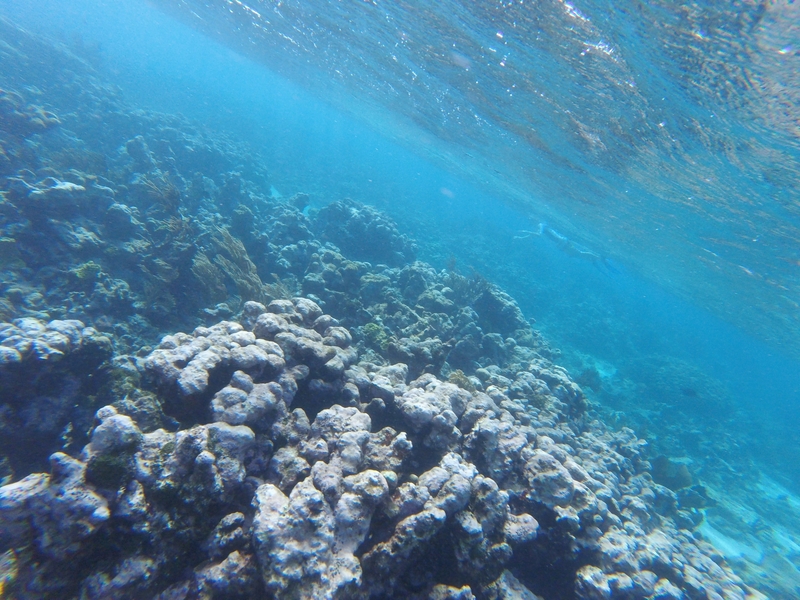 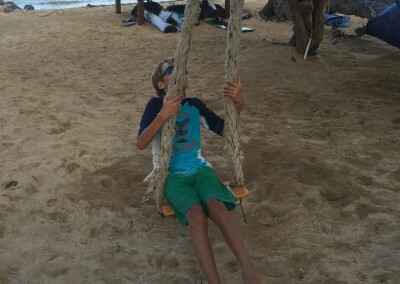 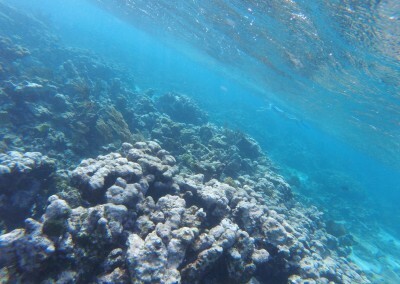 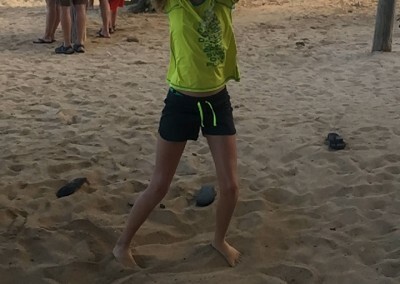 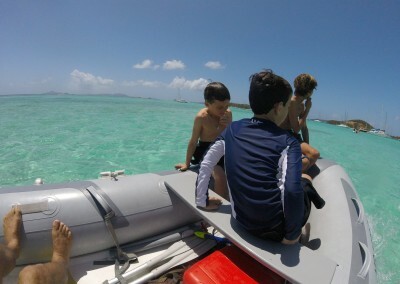 Snorkeled the Statue Park, did 2 5 hour sails, snorkeled and saw tons of fish, Swung from the spinnaker pole, jumped off the diving board on the back of Penny Lane, snorkeled and saw tons of fish, went spinnaker flying off of penny lane at Sandy Island (wait for Mira’s upcoming video!!! 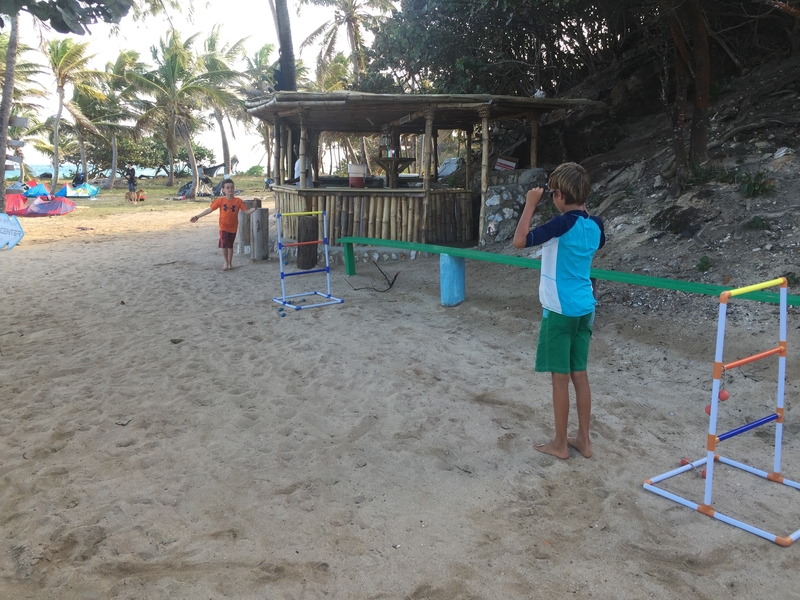 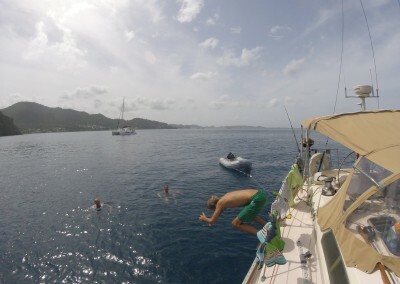 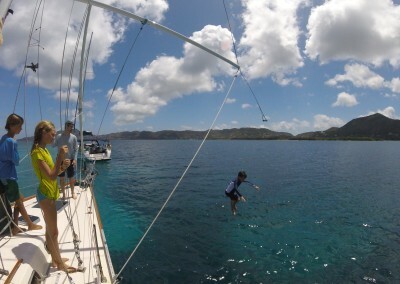 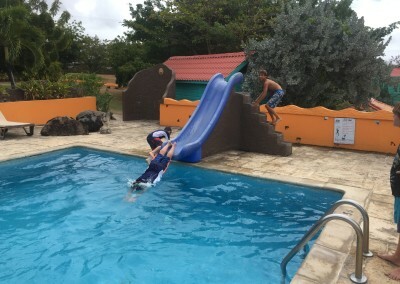 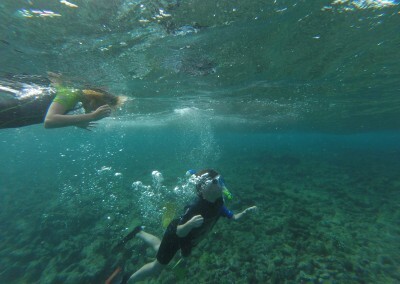 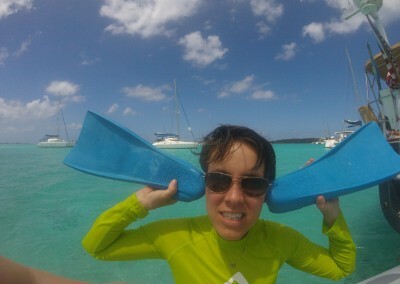 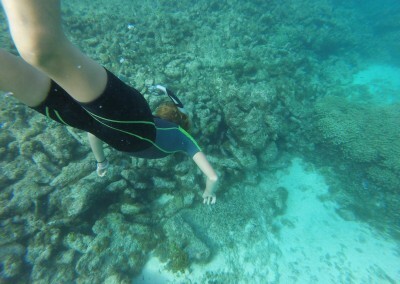 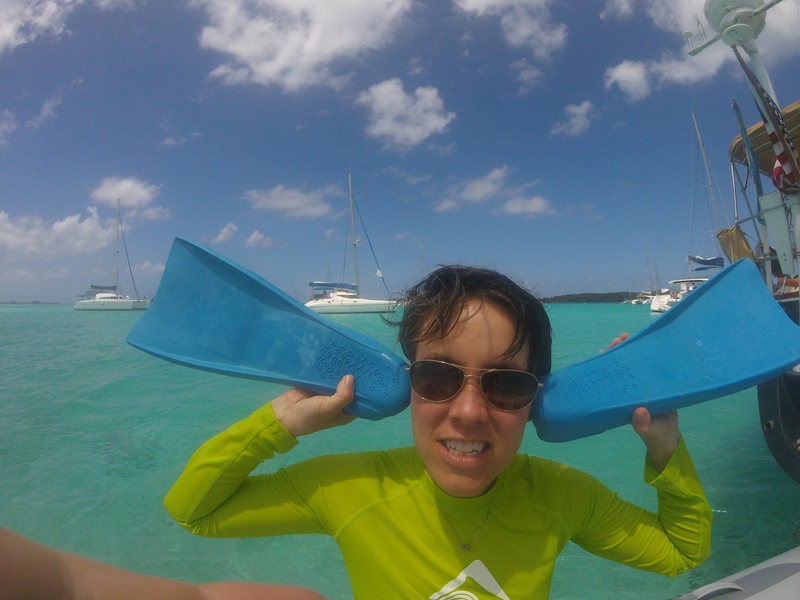 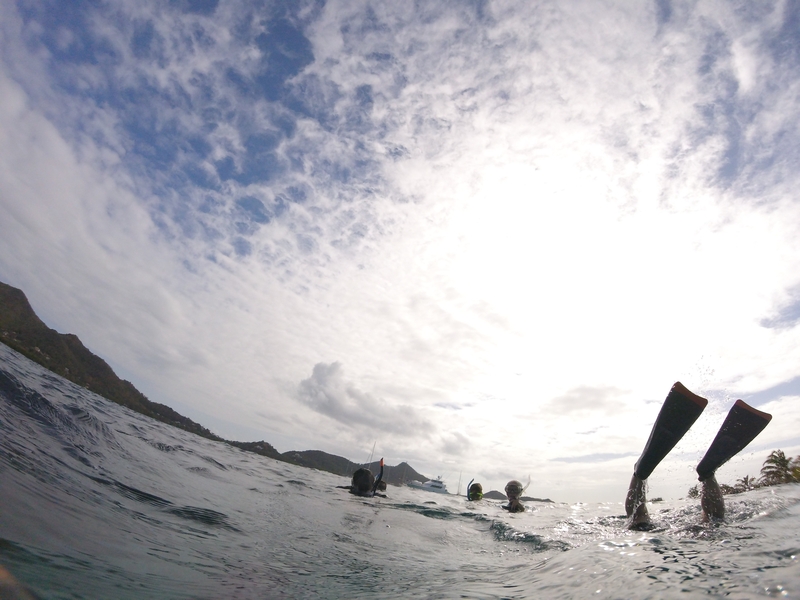 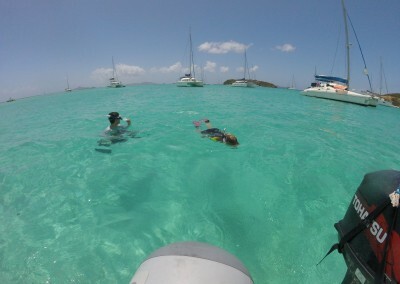 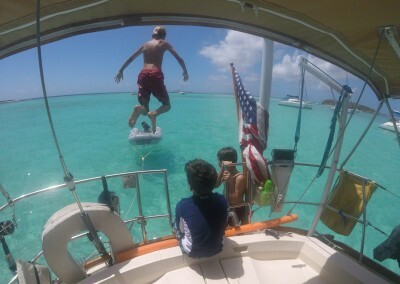 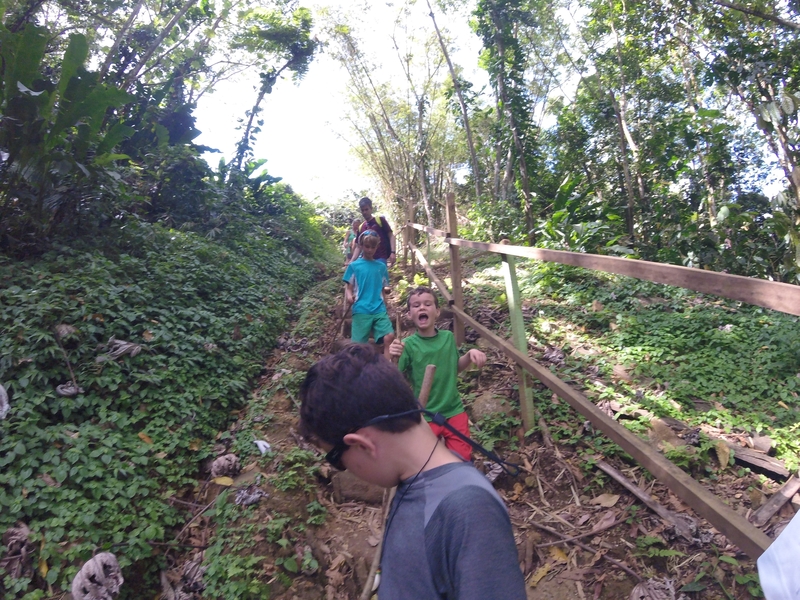 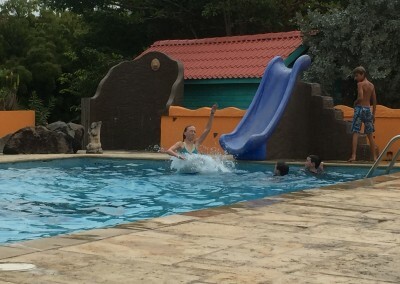 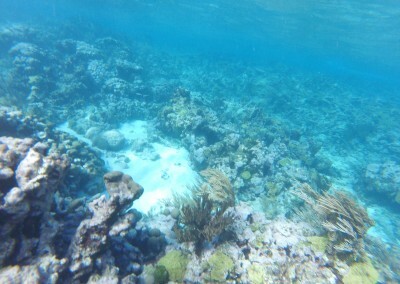 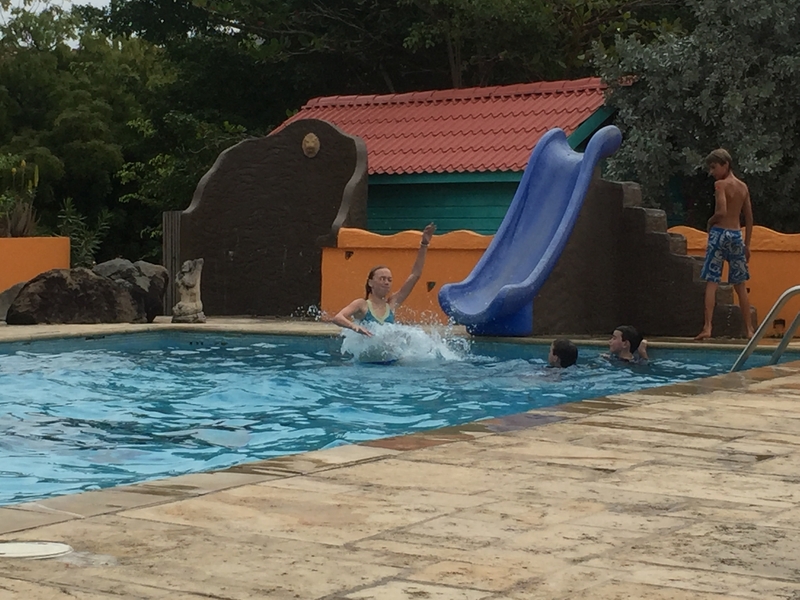 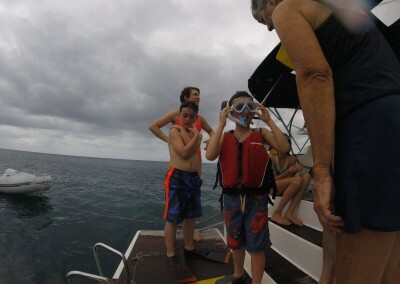 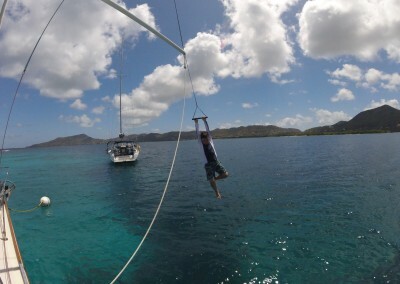 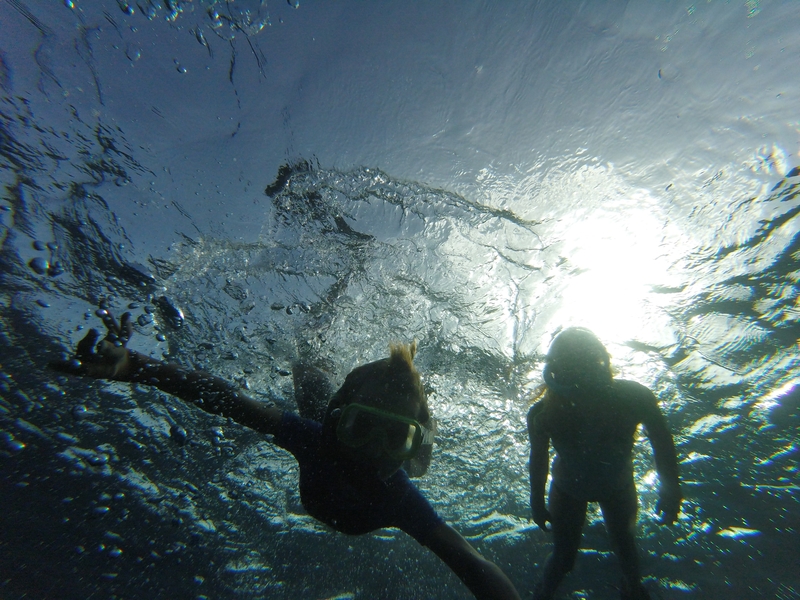 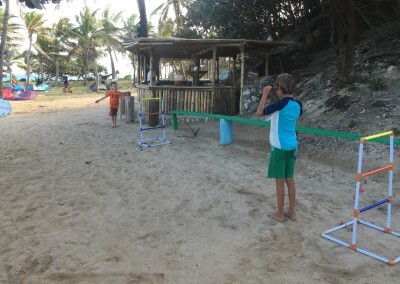 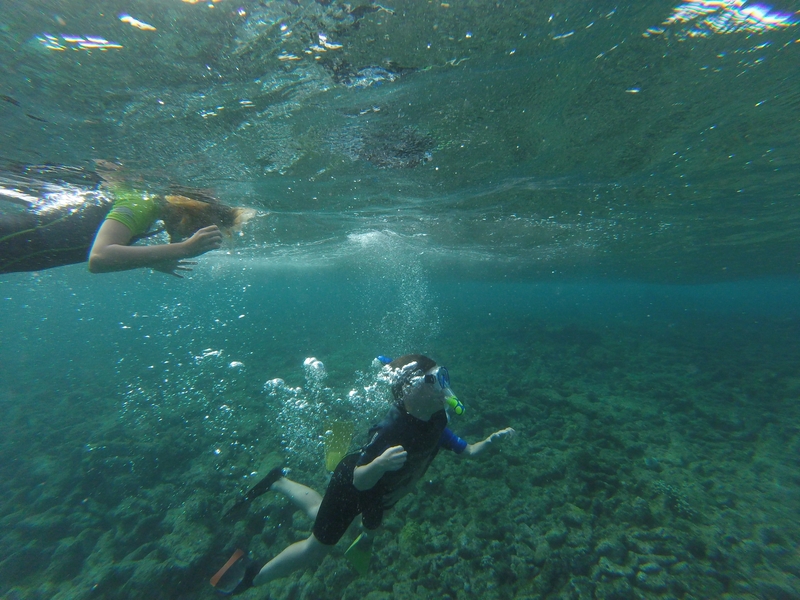 ), snorkeled with turtles and rays, ate lots of fun meals on board, played games, snorkeled and saw tons of fish , hiked up to a waterfall and swam in the pool underneath, ate yummy ice cream – we visited Grenada, Sandy Island, Carriacou, Union Island, Palm Island, and the Tobago Cays – so much fun and excitement in such a short amount of time. 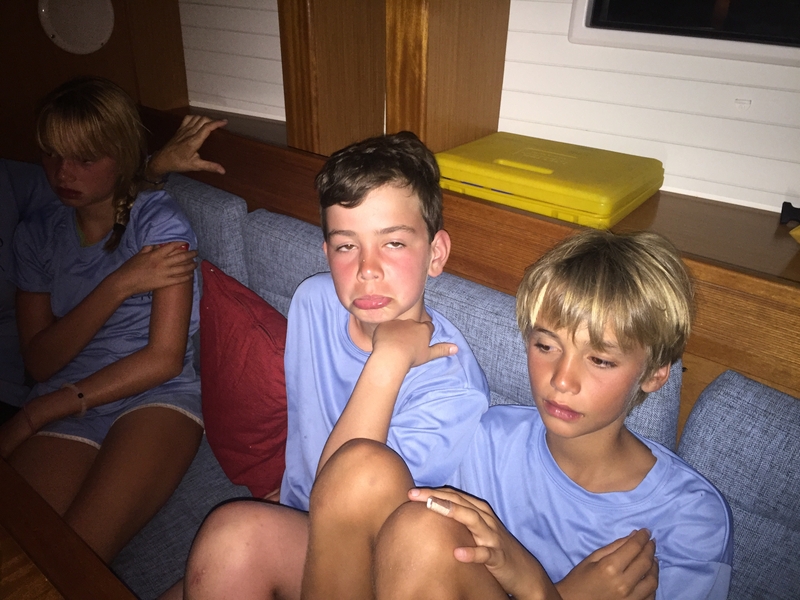 We were so sad to see Dan, Alice, Charles, and Will’s airplane fly overhead as they left this morning – they will be missed!!! 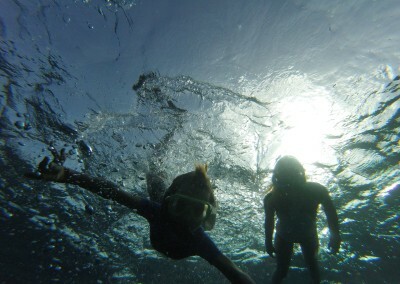 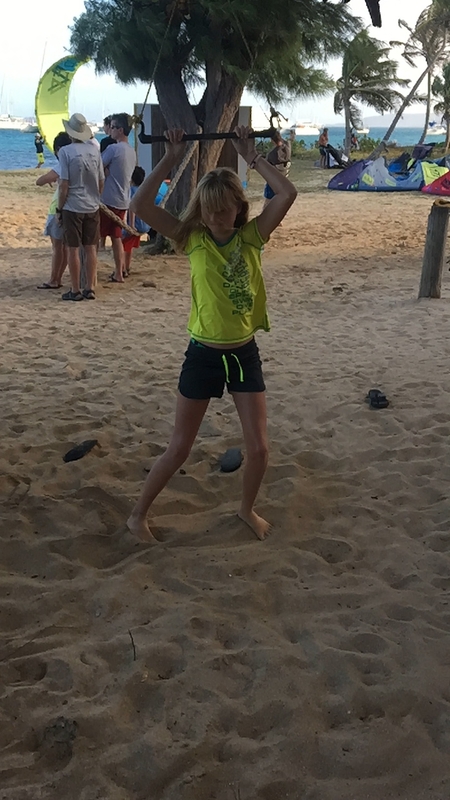 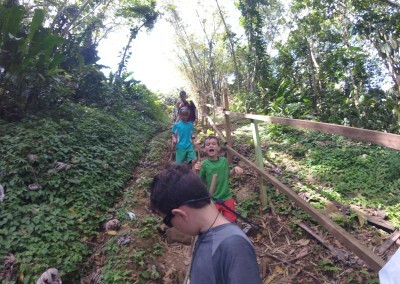 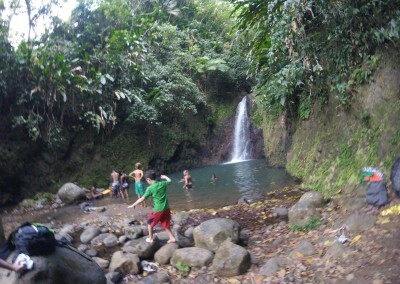 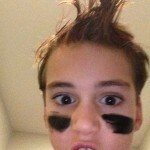 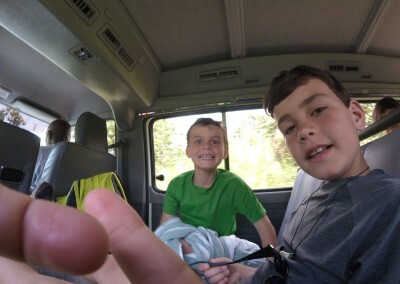 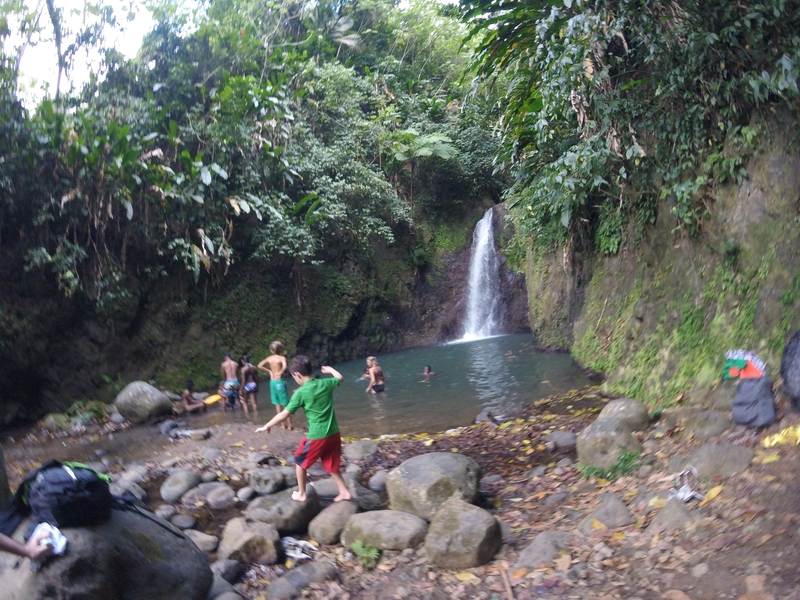 check out the pictures of our adventures below. 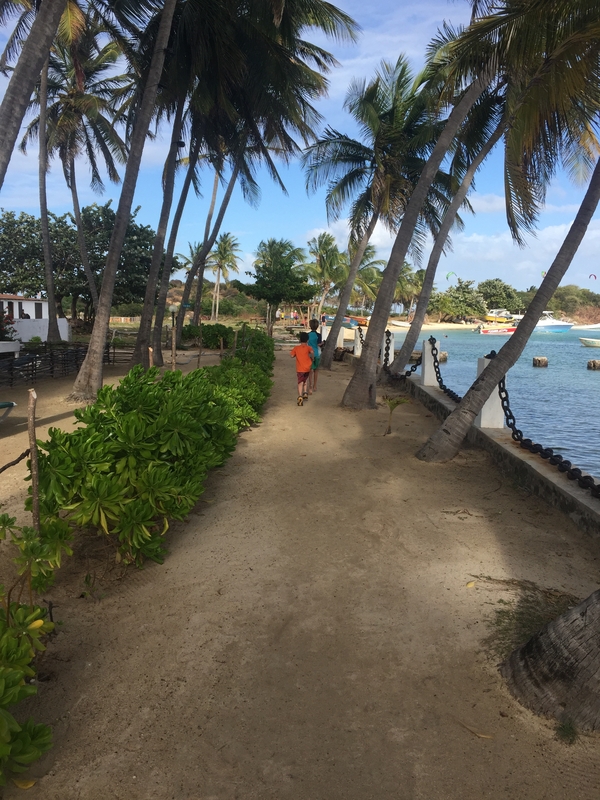 Grammy and Papa are here for another couple of days as we look to explore the south end of Grenada. 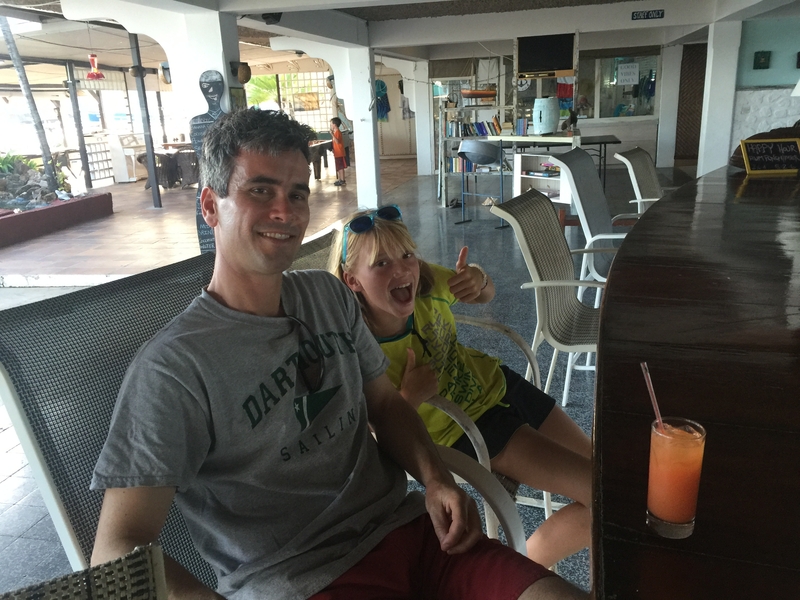 Next up, the return of Baba and Papete on April 11th – Time flies when you are having fun!